Fluorinated organic compounds, both analogues of natural products and synthetic materials, gain enormous interest by organic and medicinal chemists, biochemists, material scientists, and others because of its unique chemical properties and biological activity. Consequently, there is a continuously growing demand of methods to synthesize such compounds. Although plenty of methods to introduce fluorine and fluorinated groups into organic compounds do exist, not all used reagents can be handled easily and safely in ordinary organic chemistry laboratories. A frequently used fluorination reagent is the triethylamine trihydrofluoride complex, Et3N·3HF [triethylamine tris(hydrogenfluoride)] as a source of nucleophilic fluoride [1, 2, 3, 4]. 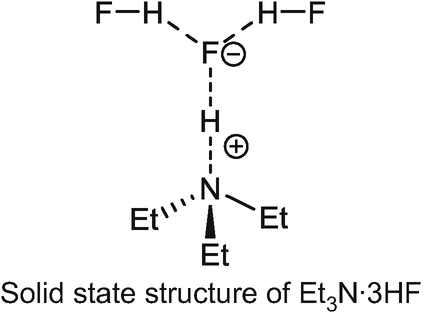 Originally, Et3N·3HF was formed in situ for ring opening of epoxides . In 1980, Franz prepared the neat reagent by addition of an ethereal solution of anhydrous HF to a slight excess of Et3N at 0 °C, followed by distillation of the separated crude product . This reagent has important advantages over anhydrous liquid HF itself and most of the other HF-based fluoride sources: (i) it is less corrosive and can be used in ordinary borosilicate glassware up to temperatures of approximately 150 °C, (ii) it is soluble in less polar and polar aprotic solvents such as methylene chloride, diethyl ether, or acetonitrile and also in substrates of different kind, and (iii) it is useful for a series of different types of fluorination reactions as shown in this chapter. Et3N·3HF is a colorless liquid at room temperature with a melting point of −27 °C, a boiling point of 78 °C at 1.5 mbar, has a density of 0.996 g/L at 25 °C, and has a pH close to neutral . In the solid state, the N-H···F hydrogen bond (bond distance 2.687 Å) is donated to the central fluoride of a H2F3─ or [F(HF)2]─ ion and binds this and the cation in a discrete ion pair . Although the reagent is less corrosive than anhydrous HF or the pyridine/HF complex (Olah’s reagent), the liquid has to be handled with care and any skin contact must be avoided. Generally, nucleophilic substitutions of different leaving groups such as halides or sulfonates with fluoride are not favored and frequently accompanied by side reactions such as eliminations or substitutions by competing nucleophiles. Although the nucleophilicity of fluoride in Et3N·3HF is lower compared to KF or Bu4NF (TEBAF), it allows substitution of leaving groups, but harsh conditions might be necessary. Thus, refluxing of 3-phenylpropyl mesylate with 10 equiv Et3N·3HF in acetonitrile for 20 h gave only 20% of the target fluoride. 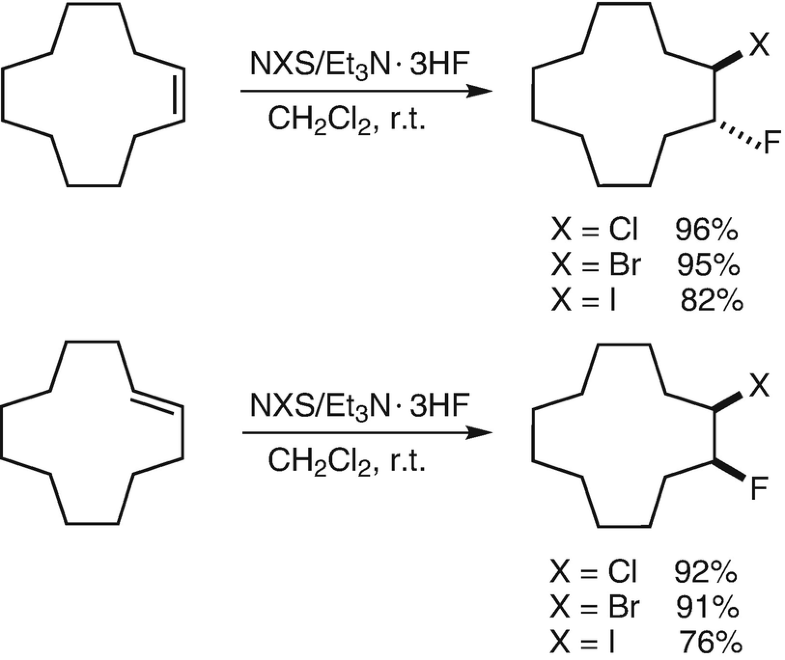 However, the nucleophilicity can be improved by addition of one equiv of Et3N (formal formation of Et3N·2HF) giving 81% of the product under the same conditions, while after addition of 2 equiv of Et3N (formal formation of Et3N·HF) less than 5% of the product was formed after 100 h of reflux  (Scheme 1). As expected, also the quality of the leaving group plays an important role. For 48% conversion of 2-bromooctane to the fluoride, refluxing with Et3N·2HF in acetonitrile for 122 h was needed (30% isolated yield), while the corresponding mesylate gave 90% conversion after 36 h (49% isolated yield). Activated bromine substituents are easily replaced using this reagent. Heating of bromoacetone with neat Et3N·3HF and one equiv of Et3N to 110–115 °C gave 90% of fluoroacetone  and 2-bromopropiophenone gave 94% yield after refluxing with Et3N·2HF in acetonitrile for 1.5 h  (Scheme 2). Another example for the nucleophilic substitution of an activated bromine by fluoride was described by Zou et al. 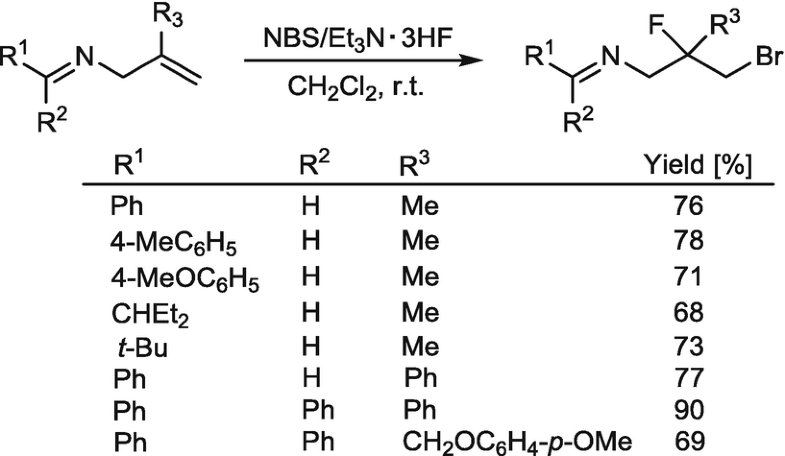 Thus, a series of substituted α-fluoroacetophenones were prepared in a one-pot reaction directly from acetophenones with 1,3-dibromo-1,5-dimethylhydantoine (DBH) as the brominating reagent and excess of Et3N·3HF effectuate the nucleophilic substitution of the formed α-bromoacetophenones  (Scheme 3). Also activated chlorine compounds can be transformed to the corresponding fluorides. For example, diethyl α-chloromalonate was transformed to the fluoride by heating with Et3N·3HF to 105–110 °C for 15 h (84% yield) and from a substituted 1-methyl-3-dichloromethylpyrazole-4-carboxylate, the difluoromethyl derivative was formed (88% yield) by treatment with Et3N·3HF  (Scheme 4). Depending on the reaction conditions, different degree of substitution can be achieved. Thus, from benzyl trichloromethyl thioether 90% of the dichlorofluoromethyl derivative was obtained by treatment with Et3N·3HF at 20 °C for 4 h, while after 10 h at 50 °C 88% of the chlorodifluoromethyl derivative was isolated. In contrast treatment with pyridine∙9HF at 20 °C for 18 h gave 94% of the trifluoromethyl compound  (Scheme 5). Similar results were obtained in the cyclohexane series. 1-Chloro-2-trichloromethylsulfenyl cyclohexane was transformed to the corresponding fluorinated thioethers under the conditions shown in Scheme 6 . A two-step process for the preparation of α-chloro-α-fluorothioethers from thioethers was described by Jouen and Pommelet. Thus, treatment of activated thioethers with two equivalents of sulfuryl chloride provided the germinal dichlorides, which were subsequently stirred with 12 equiv of Et3N·3HF at room temperature for about 15 h (conditions A) or with 2 equiv of Et3N·3HF at 80 °C for 1–2 h (conditions B) to deliver the target compounds in 46–78% yield. 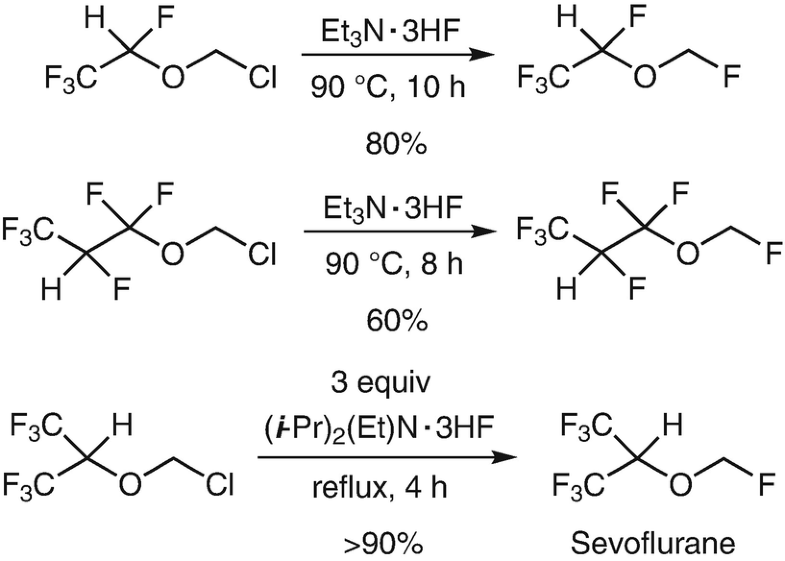 When the ethyl thioether (see entry 2) was heated with 5 equiv Et3N·3HF at 80 °C for longer than 2 h, 10% of the germinal difluoride was obtained in addition to the monofluoride  (Scheme 7). In case of more nucleophilic sulfur functions, another type of substitution of chlorine by fluorine seems to profit from the neighboring group activation by sulfur. Thus reactions of alkenes with phenylsulfenyl chloride at low temperature produced β-chloroalkyl phenyl thioethers, which on heating with 7 equiv of Et3N·3HF gave the corresponding β-fluoroalkyl phenyl thioethers with retention of the configuration suggesting a thiiranium ion as intermediate  (Scheme 8). This type of reaction was not observed with the above β-chlorocyclohexyl(trichloromethyl) thioethers. Also activated trichloromethyl compounds such as trichlorotoluene and trichloromethyl phenyl ether can be transformed to the corresponding fluorinated analogues . 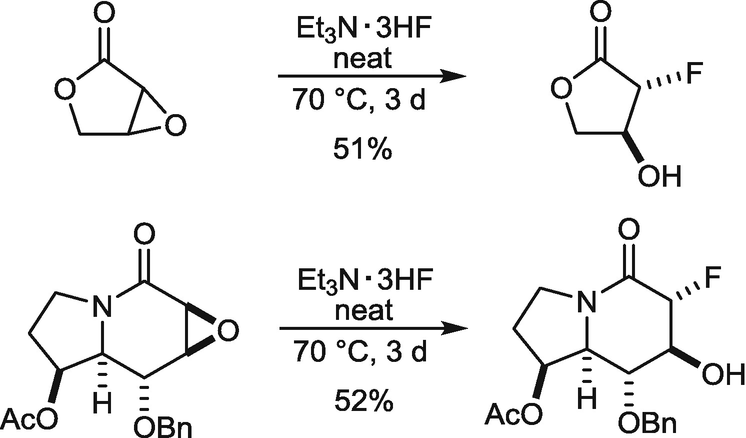 Moreover, chlorine atoms in a series of cyclic α-chloroacetals were replaced by fluoride when heated with excess Et3N·3HF in acetonitrile  (Scheme 9). In case of chloromethyl(tetrafluoroethyl) ether and chloromethyl(hexafluoropropyl) ether, the substitution of chlorine with fluorine needed heating at 90 °C for 10 h or 8 h, respectively, to get the corresponding fluoromethyl ether in 80% or 60% yield, respectively  (Scheme 10). Using a modified diisopropylethylamine·3HF reagent led to higher yields and, moreover, was useful for the preparation of 1,1,1,3,3,3-hexafluoroisopropyl fluoromethyl ether (Sevoflurane), an important inhaled anesthetic, and a couple of analogs . 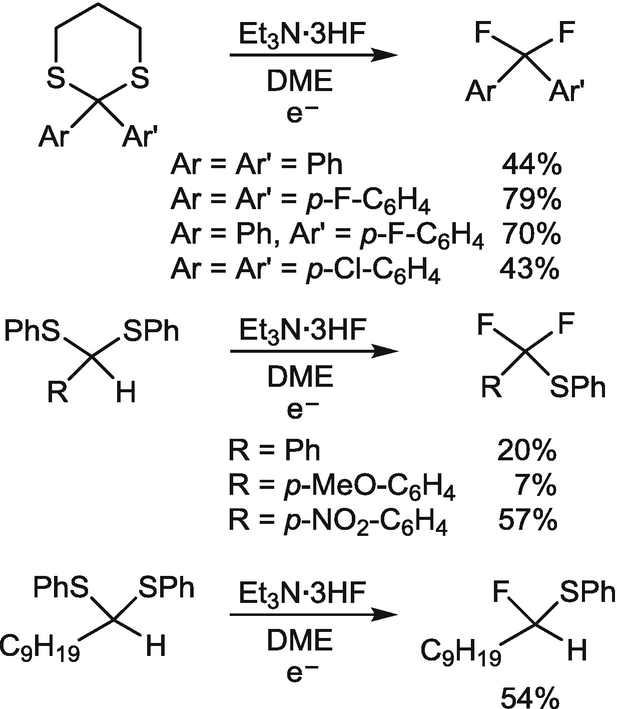 A series of considerably interesting aryl difluoromethyl ethers for the pharmaceutical and agrochemical research was prepared from aryl formates in two steps by treatment with phosphorus pentachloride and subsequent chlorine/fluorine exchange of the initially formed dichloromethyl ethers by reaction with Et3N·3HF in dichloromethane at ambient temperature. This reaction did also work with (phenylethyl)formate and (phenylpropyl)formate  (Scheme 11). In carbohydrate chemistry, this reagent was extensively used to prepare glycosyl fluorides from corresponding glycosyl bromides. One selected example is shown in Scheme 12 . Without the activation of the glycosidic bromine by the oxygen, better leaving groups are necessary. Accordingly, for synthesis of primary or secondary sugar fluorides, triflates are suitable as starting materials. Scheme 13 presents some selected examples. The reaction proceeded with inversion of the configuration. Remarkably, in the latter reaction, the oxirane ring was not opened . 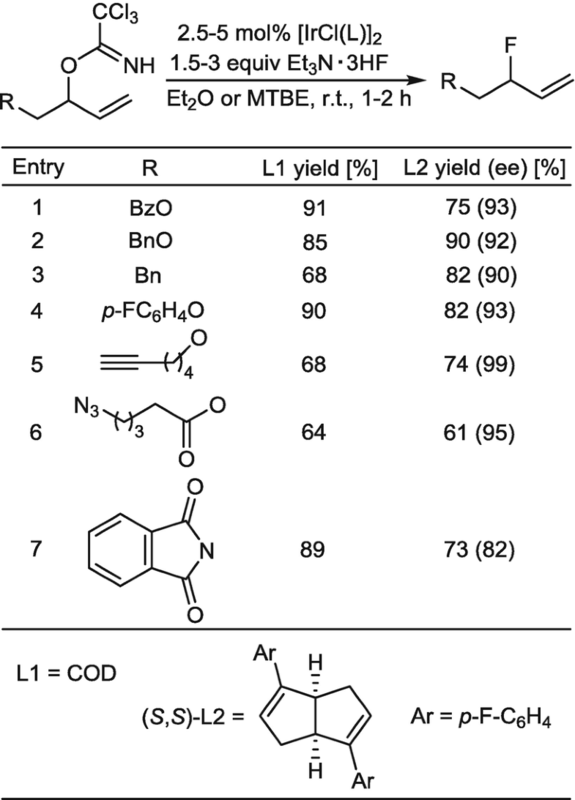 Scheme 14 shows that retention of the configuration was observed due to intermediary neighboring group participation of the 3-diallylamino functionality via an intermediate aziridinium ion . A partial shift of the 3-amino function to the 2-position was observed when the O-protected 3-(diallylamino)-2-mesyloxy carbohydrate with an equatorial amino function was heated with Et3N·3HF in acetonitrile to 75 °C for 8 h. A 7:1 mixture of the rearranged 3-fluoro- and the non-rearranged 2-fluoro derivative was isolated (Scheme 15) . A remarkable influence of the fluorinating agent on the selectivity of nucleophilic substitution was observed for reactions of 3-diallylamino-3-deoxy-2,4,6-tri-O-methanesulfonyl pyranoside as shown in the next chart. While heating with neat Et3N·3HF at 80 °C for 4 h gave the 3-fluoro compound in 73% yield by neighboring group participation and shift of the amino function from the 3- to the 2-position, treatment with Et3N·2HF at 75 °C for 26 h gave the 3,6-difluoro compound contaminated with other products  (Scheme 16). Neighboring group participation is also responsible for a ring contraction observed in the reaction of the hexopyranoside bearing the OTf leaving group in 2-position to form a 1:3 mixture of two epimeric furanosides  (Scheme 17). In addition to sulfonic acid esters, the imidazolesulfonyl substituent was found to be an excellent leaving group for fluorine substitution. Thus, treatment of an O-protected 2-imidazolesulfonyl-α-d-ribofuranose with 5–6 equiv of Et3N·3HF in ethyl acetate at 60 °C led to the sulfonic acid fluoride, which on further heating to 70 °C gave 86% yield of the fluoride with inversion of the configuration. This transformation was successfully applied in several hundred kg scale. 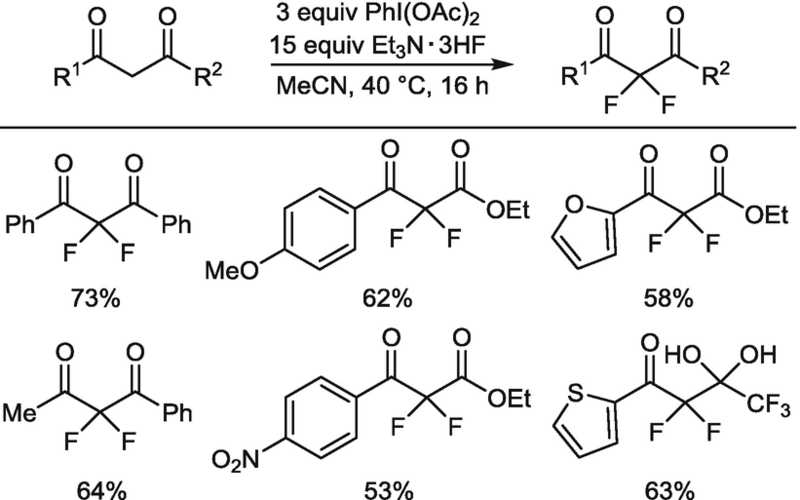 Also, an adenosine derivative was transformed to the corresponding fluorinated compound with 81% yield by heating with 6 equiv Et3N·3HF  (Scheme 18). Glycosyl fluorides have also been prepared by oxidative replacement of the sulfur moiety of thioacetals using a combination of N-iodosuccinimide (NIS) and Et3N·3HF. 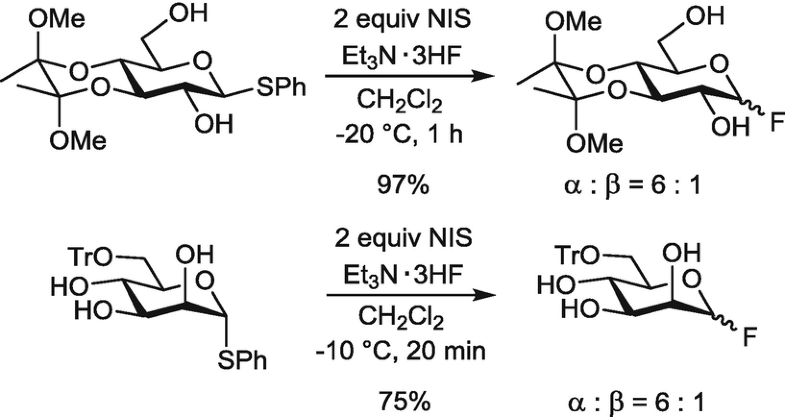 By way of example, treatment of the β-anomer of a 3,4-protected glucose derivatives with 2 equiv of NIS and large excess of Et3N·3HF in CH2Cl2 at −20 °C gave a 6:1 ratio of α- and β-anomeric glycosyl fluorides with excellent yield. 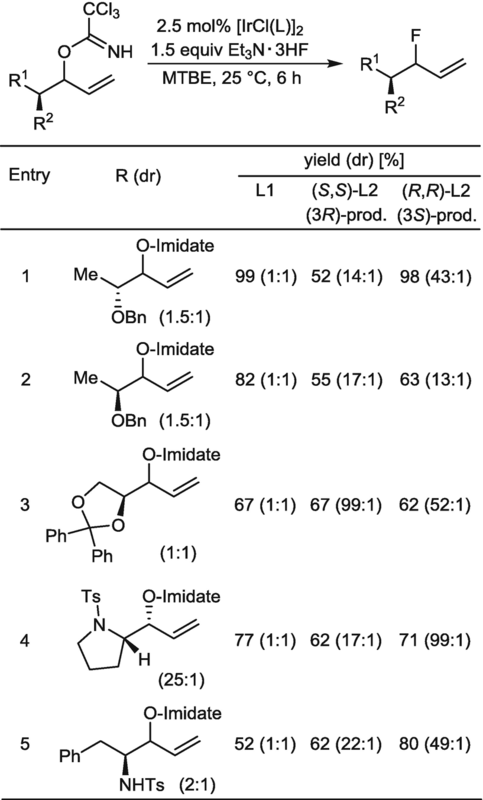 The 6-trityl protected mannose derivative with α-orientation of the phenylsulfenyl moiety gave 75% of a 6:1 mixture of anomers in favor of the α-isomer  (Scheme 19). Within a program of preparation and structural elucidation of multivicinal polyfluoroalkanes and polyfluorocycloalkanes, O’Hagan et al. applied the nucleophilic displacement of triflates by fluoride using triethylamine/HF reagents. Thus, from the enantiopure bis-triflate prepared from the vicinal fluorohydrin by heating with the Et3N·3HF/Et3N reagent in THF at 50 °C, the tetrafluoro product was obtained in 3 g scale with complete inversion of the configuration at both stereogenic centers  (Scheme 20). A similar strategy applying Et3N·3HF was used to prepare all-cis-1,2,3,4-tetrafluorocyclohexane , all-cis-1,2,4,5-tetrafluoro-3-phenylcyclohexane, and the diastereoisomeric 1,2,4-trifluoro-3-phenylcyclohexanes. The trans orientation of 1,2-difluoro moiety in one of the diastereomers was explained by an intermediate phenonium ion . Finally, this strategy was used twice to synthesize all-cis-hexafluorocyclohexane  (Scheme 21). For all these reactions, the starting vicinal fluorohydrins were prepared by ring opening of corresponding epoxides using Et3N·3HF (see section “Ring Opening of Epoxides” in this chapter). A selective monofluorination of 1,2- and 1,3-diols as well as 2-aminoalcohols was successful by heating with 1.2 equiv of N,N-diethyl-4-methoxybenzamide diethyl acetal and 2 equiv of Et3N·3HF. The reactions proceeded through the cyclic acetal of the benzamide. Only one hydroxyl group was substituted by fluorine, while the other was benzoylated. The reaction proceeds stereoselectively with inversion of the configuration as shown for (R,R)-hydrobenzoin  (Scheme 22). 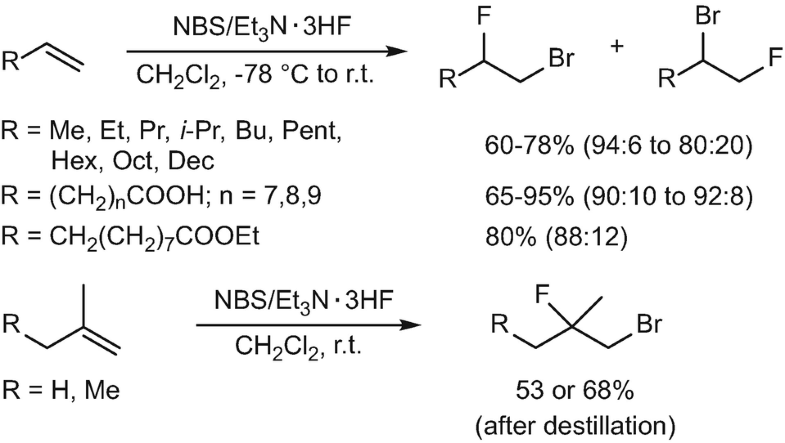 The combination of Et3N·3HF with perfluorobutanesulfonyl fluoride is an efficient reagent for the direct nucleophilic substitution of primary, secondary, or tertiary OH groups by fluorine in 65–96% yields  (Scheme 23). Another direct deoxofluorination of alcohols, aldehydes, and ketones was described by Couturier et al. Thus, treatment of primary, secondary, and even tertiary alcohols with 1.5 equiv diethylaminodifluoro-sulfinium tetrafluoroborate (Et2NSF2∙BF4, XtalFluor-E), prepared from DAST and the BF3∙THF complex, and 1–2 equiv of Et3N·3HF gave the target fluorine products in fair to excellent yields with complete inversion of the configuration. In the case of geraniol, exclusive formation of the tertiary fluoride as a consequence of an SN2’ reaction was formed. This combination of reagents is typically more selective than DAST and Deoxo-Fluor and exhibit superior performance by forming less elimination side products  (Scheme 24). Also, terminal OH-groups of long chain mono protected α,ω-diols were transformed to fluorides in good yields using XtalFluor-E in combinations with Et3N∙3HF  (Scheme 25). Yoneda, Hara et al. 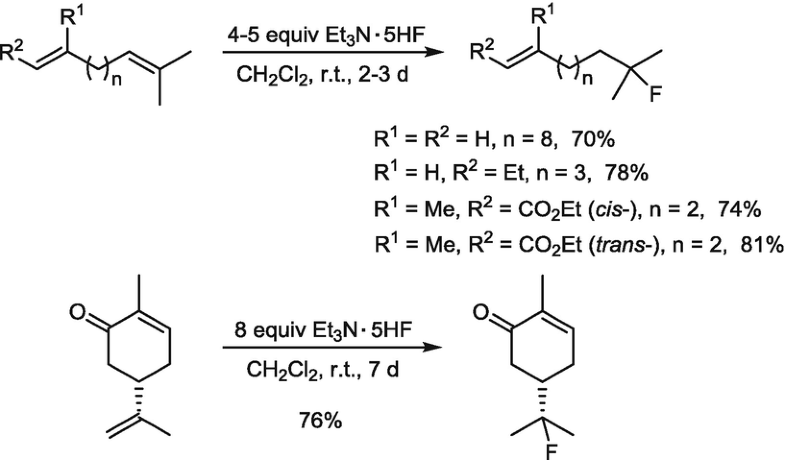 depicted that the combination of fluorinating reagents IF5/Et3N∙3HF allows selective mono- and difluorination of alcohols, epoxides, ketones, hydrazones, and also sulfides substituted with various electron withdrawing groups, such as ester, amide, ketone, nitrile, sulfone, or trifluoromethyl moieties by choosing appropriate conditions. The monofluorination product of (p-chlorophenylthio) acetate was selectively obtained using 0.6 equiv of IF5/Et3N∙3HF in hexane at 40 °C, while the difluoride was formed when the monofluoride (R = H, X = OEt) was heated with another 0.6 equiv of IF5/Et3N∙3HF or the non-fluorinated substrate was heated with 1.2 equiv of the reagent at 80 °C for 24 h. Other p-substituted arylthioacetals and acetamides were obtained in the same way as listed in Scheme 26 . With a different activation of the methylene group by a keto instead of an ester or amide group under similar conditions germinal difluorides were formed exclusively  (Scheme 27). A particular nucleophilic substitution of bromine by fluorine was described by Schlosser et al. Thus, exo-2-bromonorbornane was reacted with 5 equiv of N-iodosuccinimide and 5 equiv of Et3N·3HF in CH2Cl2 to give 56% of exo-2-fluoronorbornane probably via a hypervalent bromine species  (Scheme 28). This reaction did also work for 1-bromoadamantane, 1-bromo-1-phenylethane, 1-bromo-1,1-diphenyl ethane, and exo-2-bromo-1-bromomethyl-7,7-dimethylbicyclo[2.2.1]heptane but did not work for ordinary bromoalkanes such as 1,5-dibromopentane, bromocycloheptane, and 4-bromooct-1-ene . A fluorination by sp3 C-H activation was described by Hope, Stuart et al. Thus, the hypervalent hydroxyiodane reagent was transformed to the air and moisture stable fluoroiodane by nucleophilic fluorination. Subsequently, overstoichiometric amount of this reagent was used for the electrophilic fluorination of 1,3-dicarbonyl compounds  (Scheme 29). A similar, apparently electrophilic fluorination of 1,3-dicarbonyl compounds was described by Nash and Pattison. Thus, treatment with stoichiometric amount of hypervalent phenyliodosodiacetate and excess Et3N·3HF in acetonitrile at 40 °C provided the expected α-fluoro derivatives in fair to good yields  (Scheme 30). Increasing the employed equivalents of both the oxidant and the fluoride source led to corresponding α,α-difluorides in fair yields from the α-unsubstituted dicarbonyl compounds  (Scheme 31). Metal porphyrin and metal(salen) complexes were very frequently used for oxygenation of activated and even nonactivated C-H compounds. In 2013, Braun and Doyle used a chiral Cr(salen)Cl complex as cocatalyst for the Pd-catalyzed oxidative allylic fluorination. The cocatalyst is necessary to realize high conversion of the alkenes. 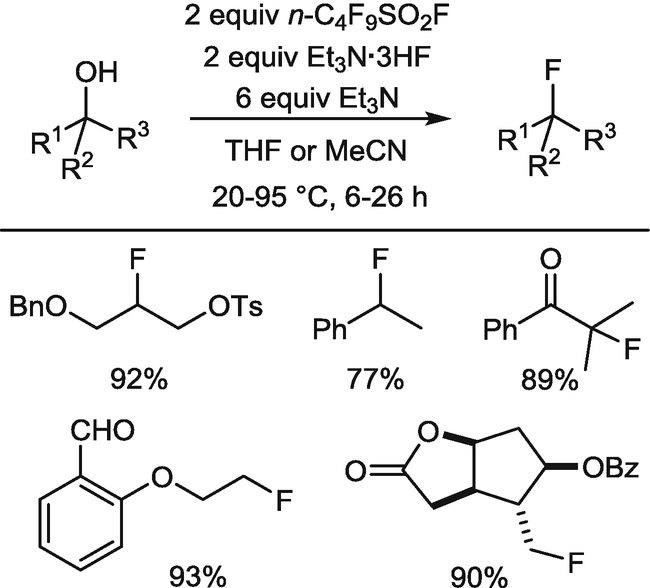 The authors did not mention, whether the fluorination is enantioselective or not  (Scheme 32). Corresponding Manganese(salen) complexes in combination with iodosobenzene and Et3N·3HF were used as mediators for benzylic fluorination of various aromatic systems  (Scheme 33). Corresponding Manganese porphyrine [Mn(tmp)]Cl in combination with iodosobenzene and Et3N·3HF in dichloroethane (DCE) was used for the first catalytic decarboxylative fluorination reactions based on a nucleophilic fluorination  (Scheme 34). In 2011, Nguyen et al. reported the first Iridium-catalyzed nucleophilic substitution of secondary allylic trichloroacetamidates by fluoride. Et3N·3HF was found to be the optimum source of fluoride providing secondary fluorides in moderate to good yields without allylic rearrangements . Later, this reaction was used also for the synthesis of chiral, nonracemic allylic fluorides. Using an enantiopure Ir-catalyst with (S,S)-configured ligand L2, (R)-configured fluorides were formed with high enantiomeric excess from racemic starting materials  (Scheme 35). Employing allylic trichloroacetimidates bearing α-stereocenter and achiral or both enantiomers of a chiral Iridium catalyst, respectively, fair to excellent yields were obtained. While with [IrClCOD]2 1:1 mixtures of diastereomers were formed, the (S,S)- and the (R,R)-ligand provided products with good to excellent diastereoselectivities  (Scheme 36). Also very complex substrates such as steroids or carbohydrates were transformed with fair to moderate yields and good diastereoselectivity in case of chiral catalysts  (Scheme 37). 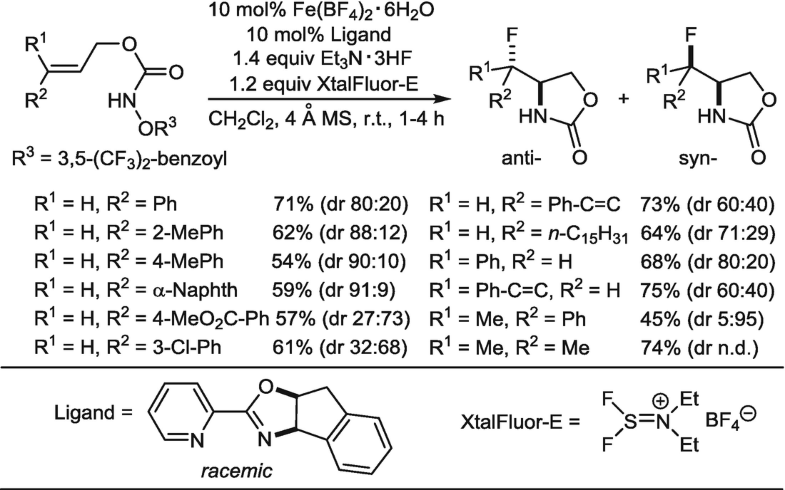 Analogously, a variety of benzylic fluorides including substituted benzyl, naphthyl, and pyridyl systems were synthesized via Rhodium-catalyzed nucleophilic fluorination of benzylic trichloroacetimidates. The reaction proceeds by partial racemization suggesting the Rh-catalyzed formation of a benzylic cation as a likely intermediate . 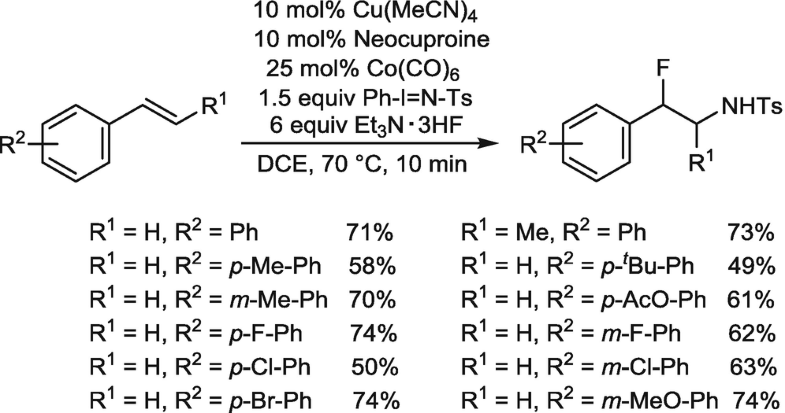 Another possibility for the synthesis of allylic fluorides is the Copper-catalyzed replacement of allylic bromine or chlorine using Et3N∙3HF as an excellent fluoride source. Interestingly, this transformation worked only with the secondary allylic halides. The requirement of a heteroatom in a nearby position was interpreted as evidence that coordination to copper throughout the reaction is an important mechanistic feature. The reaction did not work with 4-bromoundec-2-ene  (Scheme 38). 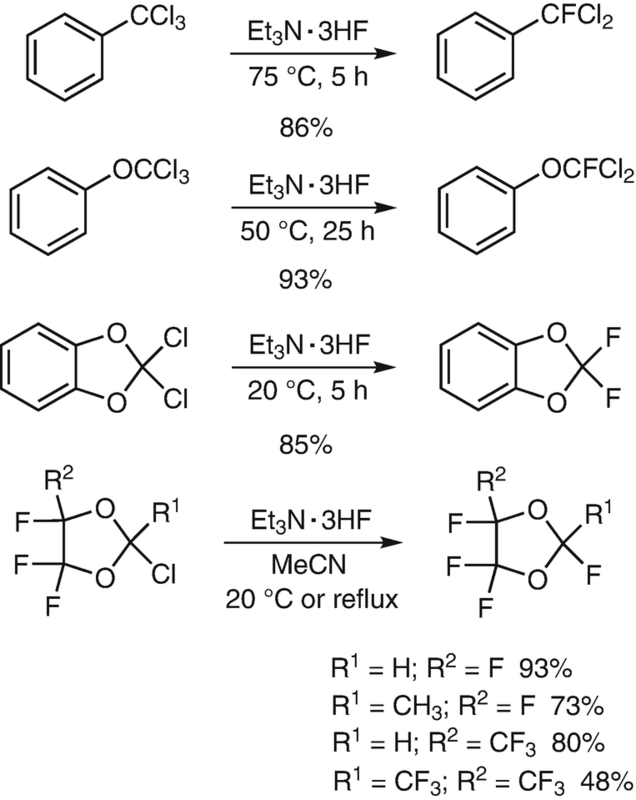 In addition to substitutions of different leaving groups at sp3 carbon centers by fluorine, there are plenty of examples of electrochemical fluorinations (ECF) of organic compounds described in literature using Et3N∙3HF as fluorine source and acting at the same time as supporting electrolyte [3, 39, 40, 41, 42, 43]. This reagent is stable up to over 2 V/SCF under electrochemical oxidation conditions . Another advantage is its solubility in many polar organic solvents including acetonitrile, DME, THF, or CH2Cl2. Moreover, the reagent itself dissolves many organic compounds and polar cosolvents are dispensable. For example, ethylbenzene was transformed to (α-fluoroethyl)benzene in 42% yield  (Scheme 39). When the benzylic position is activated by electron-withdrawing substituents and the p-position is substituted, e.g., by a methoxy group, the reaction is more efficient and can be executed in acetonitrile providing the products in good yield  (Scheme 40). Based on their results, Laurent et al. developed a diastereoselective variation of this protocol using menthol as ester component. The low to moderate diastereomeric excess (de) was attributed to the long distance between the stereocenter and the reaction center (Scheme 41) . Plenty of ECFs use sulfur functions, particularly thioethers, to activate the neighboring methylene group for fluorination. In these cases, a polar cosolvent is usually used. 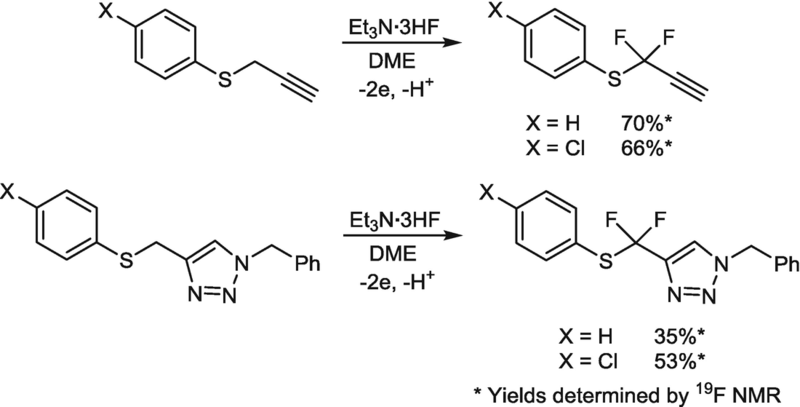 By way of example, a series of phenyl thioethers were fluorinated in α-position in moderate yields  Scheme 42. Strong electron withdrawing groups in the aromatic ring do accelerate the reaction and generally better yields were obtained particularly in case of ordinary alkyl aryl sulfides . 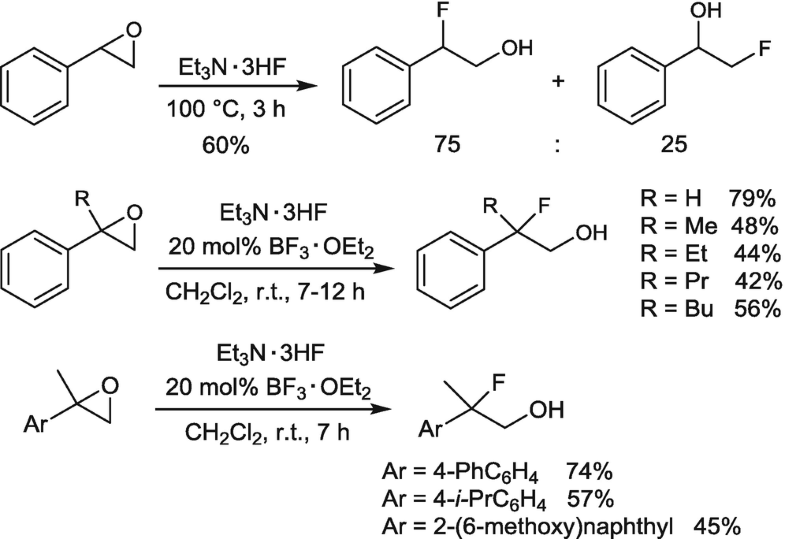 The anodic fluorination was also applied for phenylthioethers with electron withdrawing carbonyl substituents, which increase the reactivity and the yield. Monofluorination was successful as well for α-phenylthiocyclohexanones and α-phenylthiobutyrolactone. Analogously to the monofluorination of phenylthioethers also corresponding phenylselenoethers gave corresponding α-fluoro products  (Scheme 43). 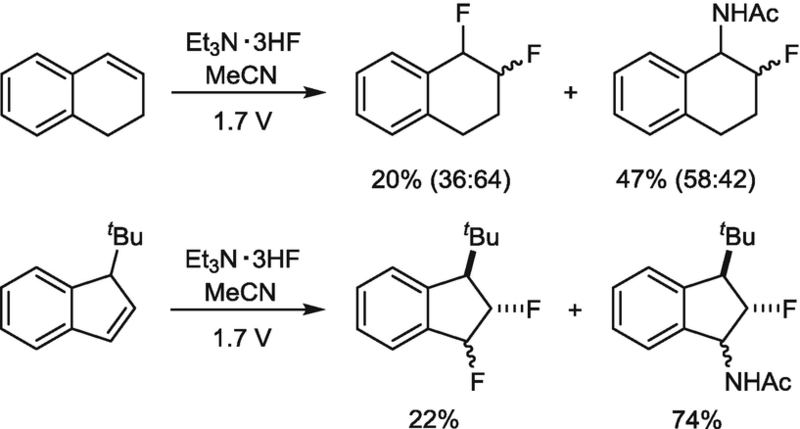 Recently, 18F-radiofluorination of methyl phenylthio acetate was described using [18F]Et4NF∙4HF as fluorinating agent and Bu4NClO4 as additional electrolyte . Radiolabeling using 18F-modified Et3N∙3HF was used so far only for 18F-labeling of aromatic positions, e.g., of N-trifluoroacetyl phenylalanine methyl ester . When a stereocenter is neighboring the active methylene group, high diastereoselectivity was expected. However, with only one methoxy group the yield (10%) and the diastereoselectivity remained low (30% de). A second methoxy group (2,3-dimethoxypropyl phenyl thioether) was needed to increase both the yield (30%) and the diastereoselectivity (60% de). 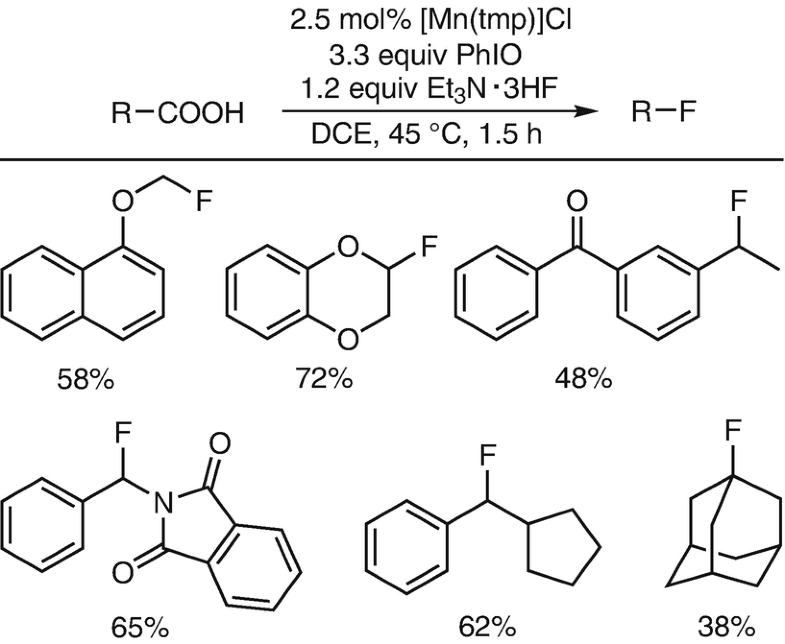 Starting from the more rigid dioxolane systems, even better yield and higher diastereoselectivity was observed, while the fluorination of the cyclic carbonate was less efficient  (Scheme 44). Furthermore, the influence of the strongly electron-withdrawing effect of a trifluoromethyl group was investigated. Thus, the anodic fluorination of (S)-2-trifluoromethyl-2-methoxyethyl phenyl sulfide gave 96% of (1R,2S)-1-fluoro-2-trifluoromethyl-2-methoxyethane with 77% de. This is in sharp contrast to the corresponding reaction of the methyl derivative, which gave only 10% yield and 36% de  (Scheme 45). Apart from the methylene-active aryl thioethers discussed so far, also heteroaryl thioethers such as 2-pyridyl- 4-pyrimidyl- , and 2-pyrimidyl  as well as 2-quinolyl and 4-quinolyl analogues  received considerable attention (Scheme 46). Several more heterocycles were attached to the sulfur, or together with electron withdrawing groups within the thioether moiety, as shown in Scheme 47. In all cases, some amount of the difluoride were formed . Carbonyl groups can be replaced by a propargyl group as the second functionality activating the methylene moiety and different heterocycles such as 2-pyridyl, 4-pyridyl, pyrimidyl, 2-quinolyl, or benzothiazolyl can be attached  (Scheme 48). 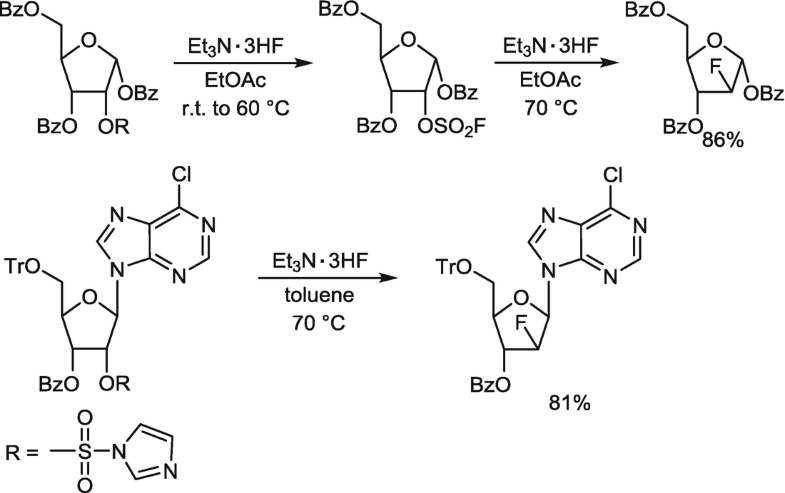 Similar results were observed when the [2 + 3]-cycloaddition products (triazoles) of these acetylenes were treated under similar conditions  (Scheme 49). In contrast, phenyl and substituted phenyl propargyl thioethers gave corresponding α,α-difluorothioethers exclusively in good yields. This is also true for N-benzyltriazol compounds derived from the acetylenes  (Scheme 50). Twofold activation of methylene groups by a sulfur moiety on the one side and a carbonyl group on the other provided the monofluoro product at 1.4 V voltage and 1.6 F current flow. At higher voltage the monofluoride is transferred to the difluoride with 91% yield . Similarly, from ethyl phenylthioacetate first the monofluoro derivative resulted, which can be transformed subsequently to the difluoride. Notably, the yield was increased, when ultrasonication was applied  (Scheme 51). Also phenylthioethers with other electron withdrawing groups attached to the methylene group deliver the corresponding monofluorides in high yields  (Scheme 52). In a similar way, also heterocyclic compounds with an analogous double activation of C-H moieties were transformed to corresponding α-fluorothioethers as shown for a N-protected β-lactam . Also γ and δ-lactams gave the monofluorides in good yield, while from the ε-lactam a complex mixture of products resulted  (Scheme 53). The sulfur function can also be a part of the heterocycle. Thus, a series of thiazolidinones was transformed to the target α-fluorothioethers. While yield was low in case of the free NH compound, N-substituted derivatives gave up to 84% yield. The diastereoselectivity was quite low and approximately the same for all compounds . Without cosolvent, in case of the N-methyl derivative the monofluorinated diastereomers were obtained as 1:1 mixture in 24% yield, while ultrasonication increased the yield to 77% and the diastereoselectivity to 38:62 . For analogous benzo-condensed thiazinones the reaction was unsuccessful for the NH-compound, while N-protected derivatives were smoothly transformed to the monofluoro compounds  (Scheme 54). 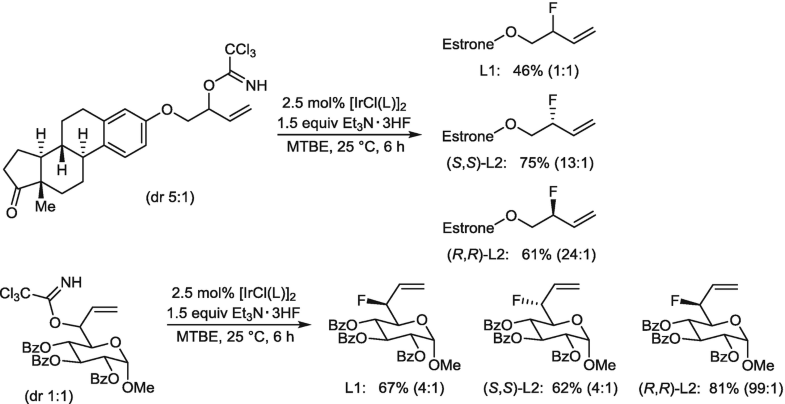 When the cyclic N-benzoyl-l-cysteine derivative was treated under similar conditions with Et3N∙3HF in DME, the monofluoro product was obtained in 78% yield with 78% de. Using the more acidic Et3N∙4HF, the diastereoselectivity increased to 94% without drop of the yield  (Scheme 55). 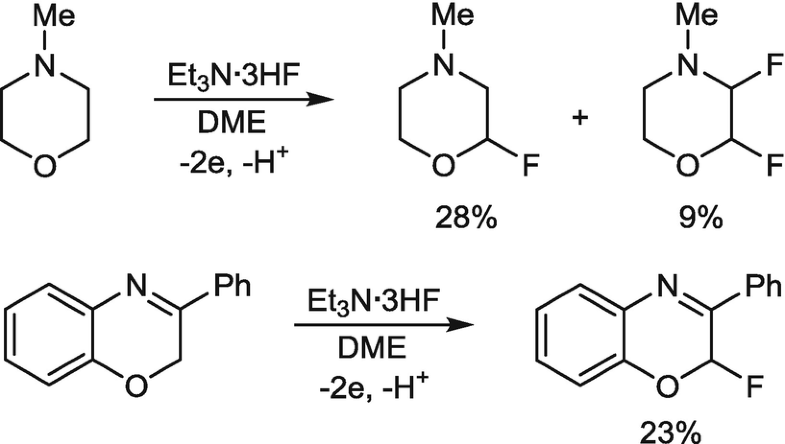 The diastereoselectivity of anodic fluorination of 1,3-dithiolanones is strongly dependent on the bulkiness of the substituent in 2-position. While the phenyl and the o-tolyl compounds gave 55% or 49% yield (4% de and 20% de), the mesityl substituted analogue (50% yield) exhibited 46% de, in favor of the trans-product  (Scheme 56). 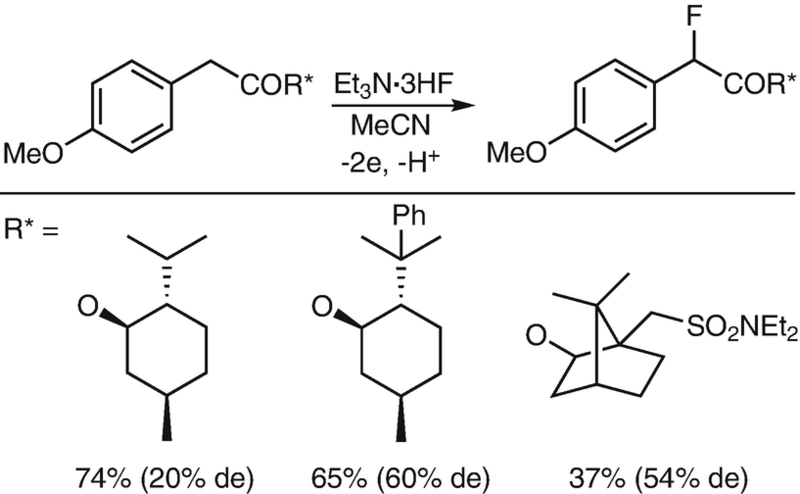 Anodic monofluorination of 2-carbethoxythiolan-3-ones was successfully performed using Et3N∙3HF in acetonitrile to give mainly the trans-isomer of the target product [6, 41] (Scheme 57). The yield and diastereoselectivity of anodic monofluorination of 3-alkyl-3-methoxycarbonyl-thian-4-one is strongly determined by the bulkiness of the R substituent neighboring the more reactive methylene group. While from the methyl compound only one diastereomer was formed, however, with extremely low yield, the benzyl derivative gave much better yield, but the de dropped to 44%. In case of the isopropyl compound, low yield was paired with very low diastereoselectivity  (Scheme 58). Particularly challenging were electrochemical fluorinations of mixed oxygen-sulfur acetals. 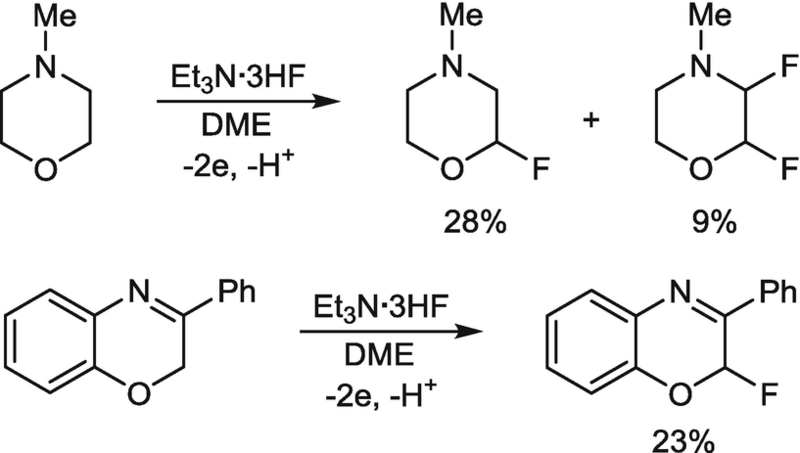 Thus, electrolysis of 3-phenylthiophthalide in liquid Et3N∙3HF gave a mixture of the α-fluoro derivative and the product of a fluorodesulfuration process, both in relatively low yield. When the electrolysis is carried out in the more acidic Et3N∙4HF, the fluorodesulfuration product was formed exclusively  (Scheme 59). This type of reaction is significantly depending on the fluoride source but also from the solvent. Thus, from phenylthioethylene carbonate the α-fluorination product was formed in DME, while the fluorodesulfuration product was formed in CH2Cl2  (Scheme 60). Fluorodesulfuration was also observed when 3-phenyl-2-(phenylsulfanyl)benzoxazine was anodically oxidized in the presence of different ammonium salts as mediators. Best results were achieved when 2 equiv of Bu4NBr were added. In this case, 72% of the monofluoride was isolated. A fluoro-Pummerer-like mechanism was proposed involving bromide oxidation to bromonium, which oxidizes the sulfide. The formed sulfonium group is a good leaving group, which is substituted by fluoride. Also other aryl substituents and pyrido[3,2-b][1,4]oxazine derivatives were monofluorinated  (Scheme 61). Anodic fluorodesulfuration of dithioacetals is significantly dependent on the nature and number of substituents. From ketone dithioacetals germinal difluorides are formed, while from benzaldehyde dithioacetals α,α-difluorothioethers, and from aliphatic aldehyde dithioacetals monofluoro thioethers are formed  (Scheme 62). 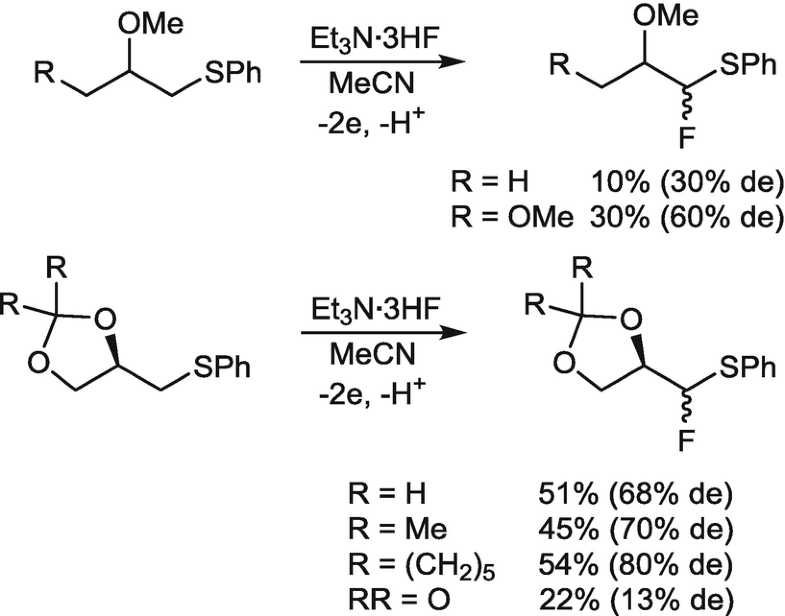 Anodic monofluorodesufuration of dithioacetals bearing electron-withdrawing ester, acetyl, and nitrile groups at the α-positions yielded the monofluoro compounds  (Scheme 63). The butyl thioesters of benzoic acid were also suitable as starting material. 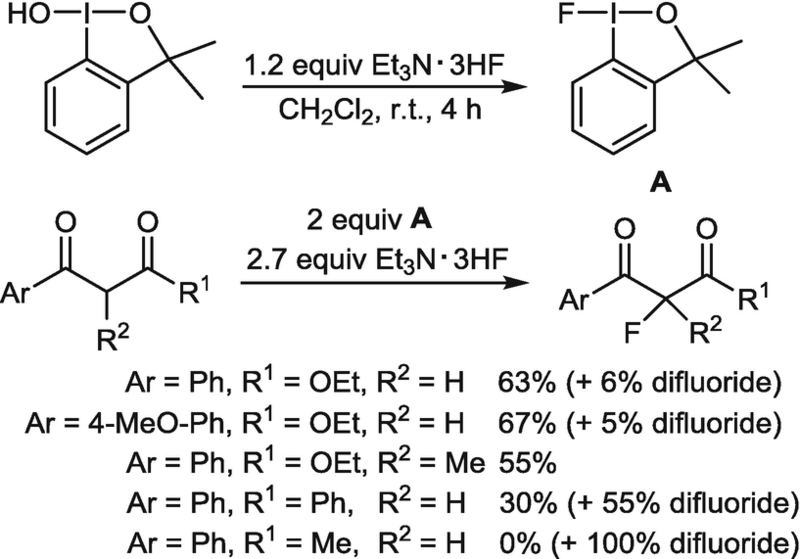 For compounds substituted in the aromatic ring or at the alkyl group, however, Et4NF∙4HF was more useful than Et3N∙3HF due to the oxidation potentials  (Scheme 64). Hypervalent p-methoxy-iodobenzene chlorofluoride was formed by electrochemical oxidation of iodobenzene in the presence of Et3N∙3HF and 0.05 equiv Et4NCl as a mediator in CH2Cl2 and used for indirect anodic gem-difluorination of diaryl dithioacetals  (Scheme 65). 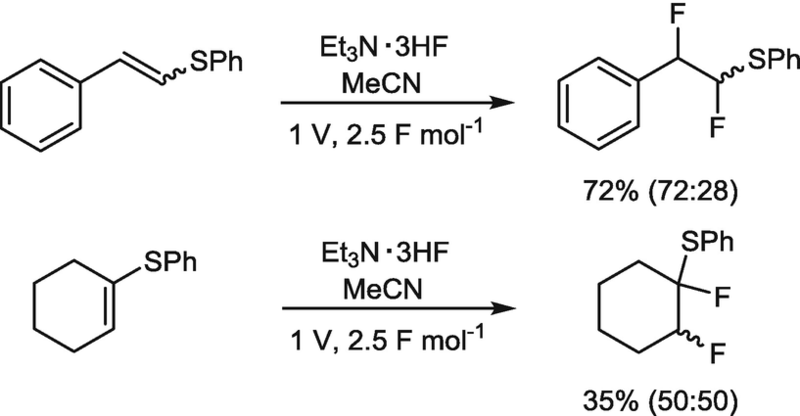 Also the α-position of ethers can be monofluorinated electrochemically using Et3N∙3HF. However, there are only few examples, e.g., N-methylmorpholine gave 28% of the monofluoride and 9% of the vicinal difluoride . From 3-phenyl-2H-1,4-benzoxazine, the α-fluoro derivative was formed in 23% yield  (Scheme 66). Alkyl iodides have been converted to alkyl fluorides by anodic oxidation. A hypervalent iodonium species is supposed to be an intermediate. A simple nucleophilic substitution is not competing since the generally better leaving group, tosylate, is not reacting. Also other terminal functional groups such as ester, ketone, and chloro are tolerated. The reaction proceeded under retention of the configuration in case of the cyclohexane derivative due to neighboring oxygen participation  (Scheme 67). An overview on ring opening of epoxides with different fluoride donors was given by Böhm covering the literature until 1990 . Another review by Miethchen and Peters covers the literature until 1996  and Haufe reviewed syntheses of vicinal fluorohydrins, among others by epoxide ring opening, until 2003  or 2005 . First, in situ formed Et3N·3HF was applied for ring opening of activated epoxides like styrene oxide to form a 75:25 mixture of the regioisomeric fluorohydrins with 60% yield after heating to 100 °C for 3 h . When 20 mol% of BF3·OEt2 (in relation to Et3N·3HF) was added, the reaction was complete at room temperature after 12 h resulting in an exclusive conversion to the benzyl fluoride (79% yield) . When 1-alkyl-1-phenyl oxiranes were reacted with this modified reagent at room temperature for 7 h, moderate yields of the corresponding 2-fluoro-2-phenylalkan-1-ols were isolated. Under identical conditions also other 2-arylpropene oxides were transformed to the corresponding fluorohydrins, which were oxidized to the 2-fluoro analogues of the “profen” family of anti-inflammatory agents fluorprophen, ibuprophen, and naproxen  (Scheme 68). Other monosubstituted oxiranes were also treated with Et3N·3HF under different conditions depending on the electronic nature of the substituents to give either a mixture of regioisomers or one isomer exclusively . The regiochemistry of ring opening of long chain terminal epoxides was significantly depending on the fluorinating reagent. From the epoxide of ethyl undec-10-ene carboxylate with Olah’s reagent a 92:8 mixture, with Et3N·3HF a 45:55 mixture and with KHF2 a 18:82 mixture of the secondary and primary fluorides were observed . Vinyl oxirane gave exclusively the allylic fluoride in 48% yield after stirring in CH2Cl2 at r.t. for 36 h. When the optically active vinyl oxirane (>99% ee) was heated with Et3N·3HF in THF in the presence of sodium sulfate at 70 °C overnight the yield was 40%, but the enantiomeric excess dropped to 80% ee  (Scheme 69). Longer chain compounds with epoxide moieties at both ends of the chain were also transformed to mixtures of the regioisomeric α,ω-bis-fluorohydrins. When methyl groups are attached to the 2- and 2′-positions the reaction became highly regioselective and the secondary fluoride was isolated exclusively due to the better stabilization of intermediate secondary cationic species  (Scheme 70). From γ-lactones with an exocyclic epoxide ring, after long time heating with neat Et3N·3HF at 70 °C the fluorohydrins with primary fluorine were formed exclusively . Heating of the nor-hydroxy epoxide (R1 = R2 = H) at 140 °C for 10 min gave 80% yield of the primary fluoride  (Scheme 71). Cycloalkene oxides of different ring sizes were ring opened by heating with neat Et3N·3HF. Much shorter reaction times are needed when microwave irradiation was applied  (Scheme 72). When the syn-bis-epoxide of cyclohexa-1,3-diene was heated with neat Et3N·3HF at 90 °C for 3 h, a crude single regio- and diastereoisomer was isolated as a crystalline solid, which was used for the transformation to the all-cis-tetrafluoride . In case of the cis-5,6-difluoro analogue, under the influence of the neighboring fluorines, the regioselectivity was reversed and the 2,3,5,6-tetrafluoro-cyclohecane-1,4-diol was isolated with 40% yield  (Scheme 73). 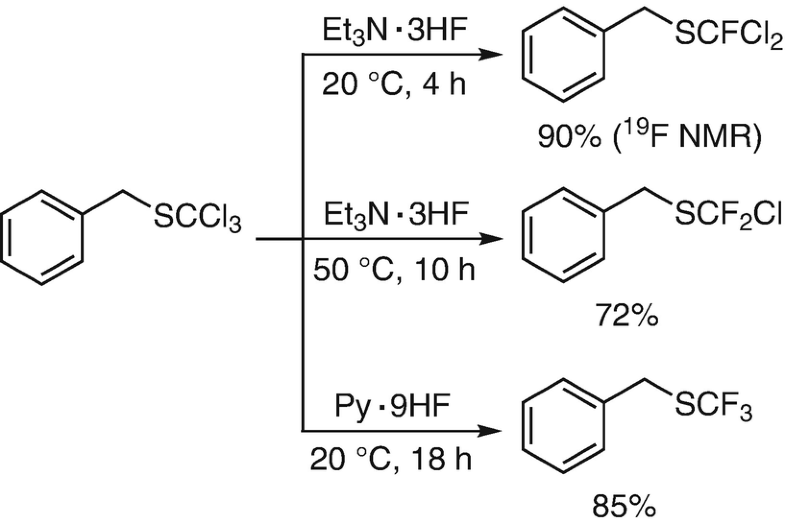 In contrast, when the syn-bis-epoxide of 3-phenyl-cyclohexa-1,4-diene was heated with Et3N·3HF at 130 °C for 45 h, a 55:45 mixture of two regioisomers was obtained in 81% yield  (Scheme 74). Also epoxides of heterocyclic systems when heated with Et3N·3HF yielded fluorohydrins [62, 63] (Scheme 75). 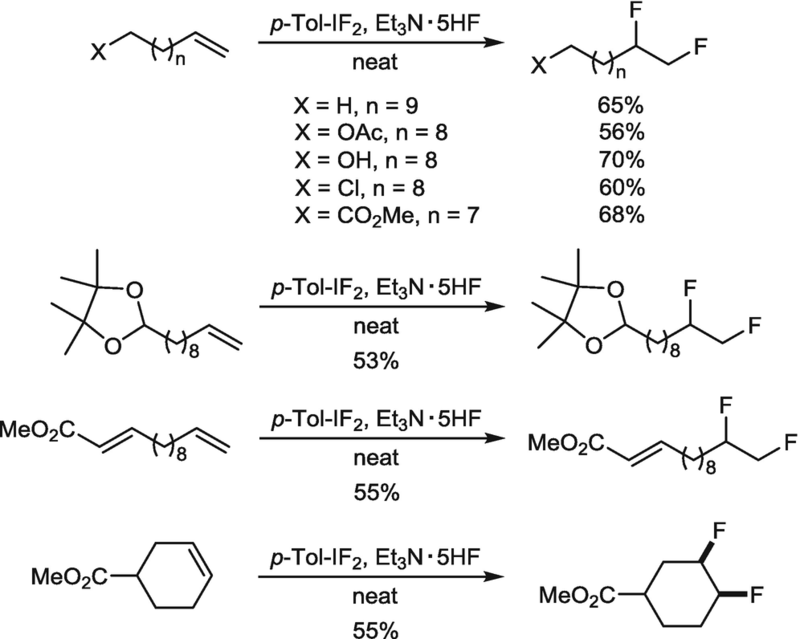 When applying epoxides with norbornane basic skeleton, cationic rearrangements in the intermediates led to fluorohydrins with 1,3-position of the functional groups  (Scheme 76). The stereospecificity of epoxide ring opening was demonstrated for two diastereomeric long chain internal epoxides yielding the corresponding diastereomeric fluorohydrins exclusively by anti-specific ring opening  (Scheme 77). 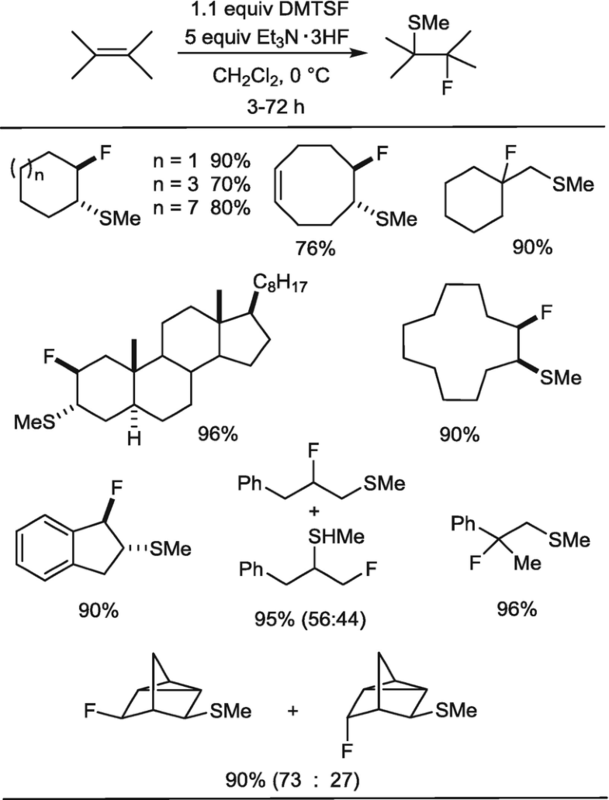 When an enantioenriched 4-(4-propylcyclohex-1-yl) substituted 3,4-epoxybut-1-ene (~90% ee) was heated in neat Et3N·3HF at 120 °C for 18 h, the optically active fluorohydrin was isolated with 57% yield  (Scheme 78). Within a program of synthesis and structure of stereoisomeric multivicinal polyfluoroalkanes, O’Hagan et al. 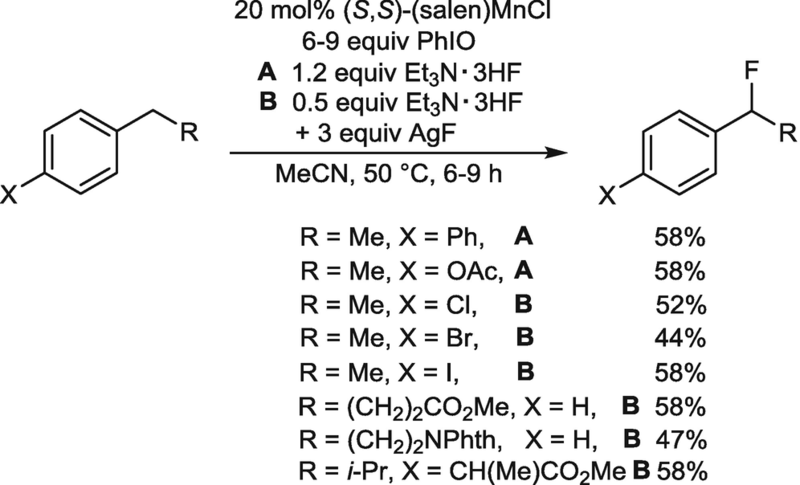 published a series of ring openings of β-substituted epoxides . Among them, substituted syn- or anti-α,β-epoxy-γ-fluoroalkanes were used as starting materials. 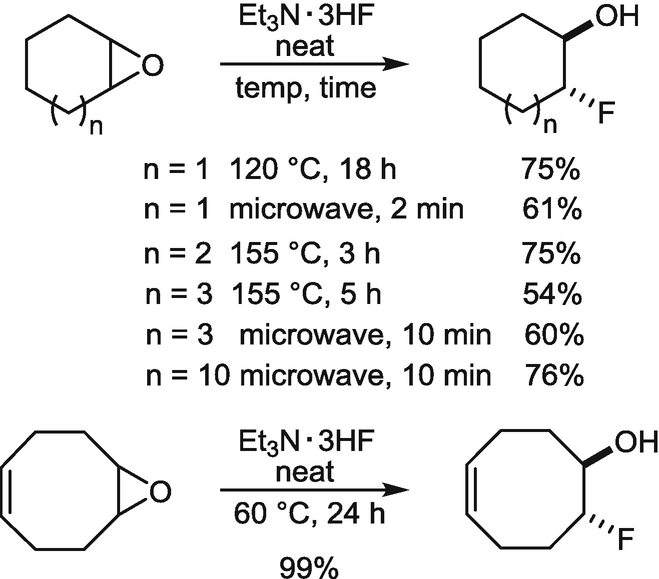 While heating of the (2S,3S,4R)-isomer with Et3N·3HF in CHCl3 at 100 °C in a Teflon lined sealed bomb for 3 days gave the corresponding fluorohydrin with 58% yield (Scheme 79), the ring opening of the other diastereomer was more challenging. Under the same conditions, among other products, the target fluorohydrin was isolated with 33% yield . A series of stereoisomeric bis-epoxides was transformed to the corresponding fluorohydrins under forced conditions. For instance, the anti-isomer shown in Scheme 80 gave the trifluorodiol in 44% yield, while the syn-isomer led to the target diastereomer in 42% yield . Recently, Hunter et al. published a couple of stereoselective syntheses of homologated amino acids with two or three vicinal fluorines positioned along the backbone [70, 71]. 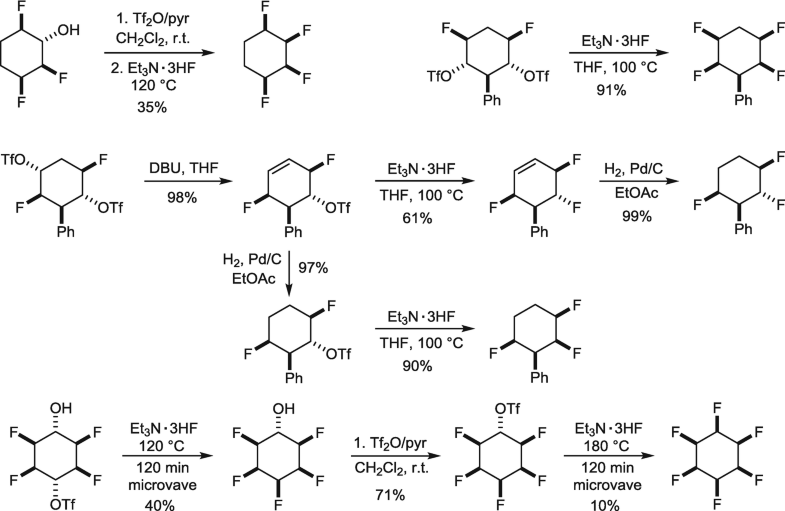 Epoxide ring opening with Et3N·3HF under heating to 120 °C or microwave irradiation at 140 °C was used as a convenient access to the precursor fluorohydrins in fair yields. Subsequent nucleophilic substitution of the OH function by treatment with Deoxo-Fluor, oxidation of the phenyl ring and deprotection of the amino function led to the polyfluorinated γ- or δ-amino acids (in Scheme 81 only one enantiomer is depicted, the other isomer reacted analogously to the enantiomeric product) . The same protocol was used for the preparation of 2,3,4-trideoxy-2,3,4-trifluoro hexose analogues of d-glucose and d-altrose  (not shown in a Scheme). A similar strategy was already used for an elegant synthesis of the enantiomeric 2-deuterofluoroacetic acids. 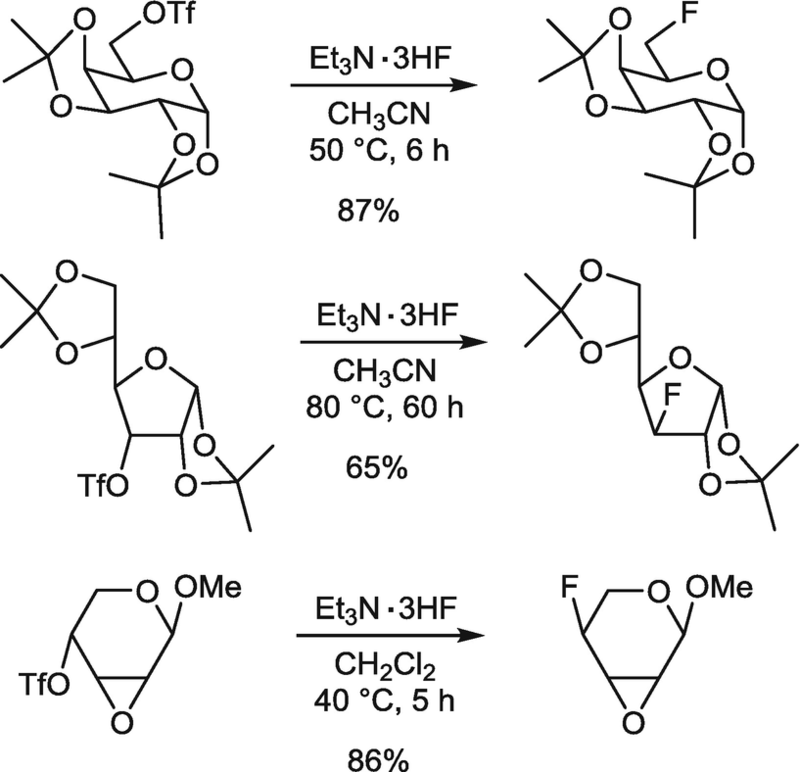 The respective almost optically pure 1-deutero-1,2-epoxyoctan-3-ol was treated with Et3N∙3HF to obtain the corresponding 1-deutero-1-fluorooctane-2,3-diol with complete inversion of the configuration at carbon number one. Subsequent diol cleavage using RuCl3/NaIO4 led to the shown (R)-configured acid  (Scheme 82). Also vinyl epoxides were subjected to ring opening with Et3N·3HF. In all cases the reactions were highly regioselective delivering the tertiary fluorides under mild conditions. The reaction is also diastereoselective as demonstrated with 1,3-cyclohexadiene monoepoxide  (Scheme 83). 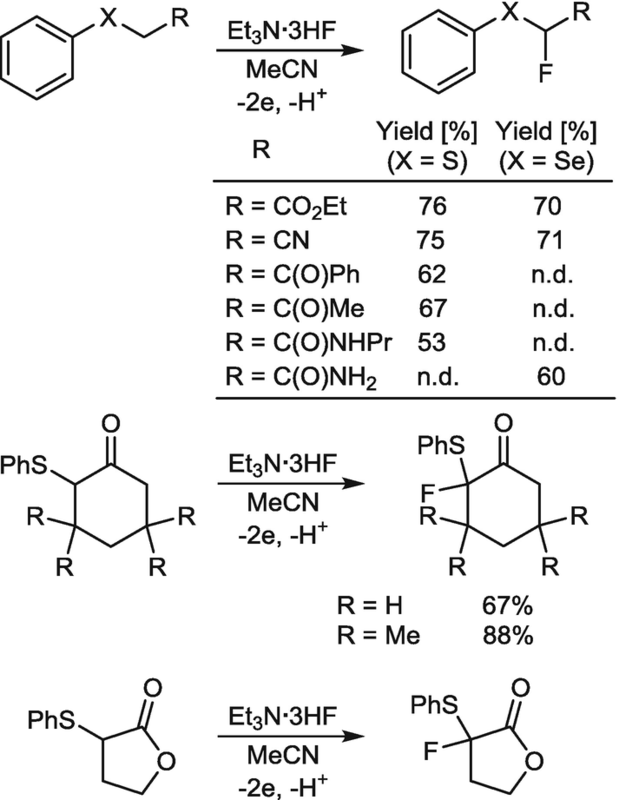 A highly regioselective Rh-catalyzed variation was described by Zhang and Nguyen. Remarkably, the reactions of a variety of substrates proceeded smoothly at room temperature to give the desired 1,2-fluorohydrins with fluorine in the allylic position in moderate to good yields. Saturated epoxides did not react under similar conditions even after very long reaction time. For more convenient isolation of the products, the crude mixtures were treated with 4-fluorobenzoyl chloride to form corresponding esters  (Scheme 84). 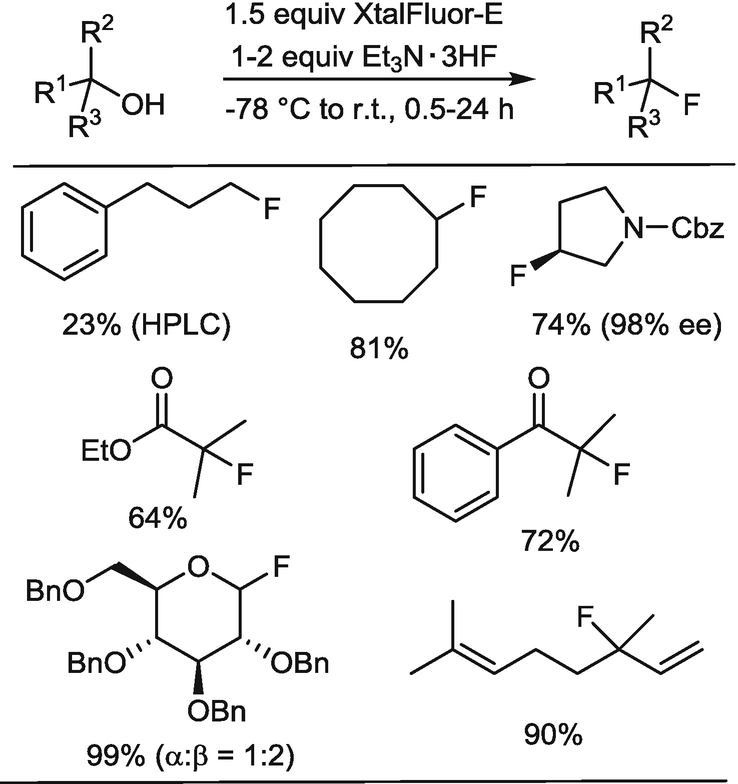 Optically active vicinal fluorohydrins with fluorine in the allylic position were also obtained in Rh-catalyzed ring opening reactions of 2,3-benzoanulated 7-oxabicyclo[2.2.1]hepta-2,5-dienes with Et3N·3HF in the presence of the chiral ligand (R,S)-ppf-PtBu2 (Josiphos). The method is mild, safe, efficient and highly regio- and stereoselective, but limited to benzoanulated 7-oxanorbornadienes. The formation of trans-1,2-fluorohydrins was not intuitive and the mechanism of formation is suggested to be an SN2’ nucleophilic displacement  (Scheme 85). When α-fluoro epoxides were heated with Et3N·3HF at 125 °C for 2 h, rearrangement to α-fluoro ketones occurred as shown in Scheme 86. Also α-fluoro epoxides derived from terminal or cyclic alkenes were rearranged analogously . In addition to ring opening of epoxides, ring opening of cyclic sulfates can be applied for synthesis of vicinal fluorohydrins. Generally, the sulfates are more activated and nucleophilic attack of fluoride equivalents occur under milder conditions and can be applied also for sterically crowed starting materials. Thus, the diastereomeric cyclic sulfates were used as starting materials. 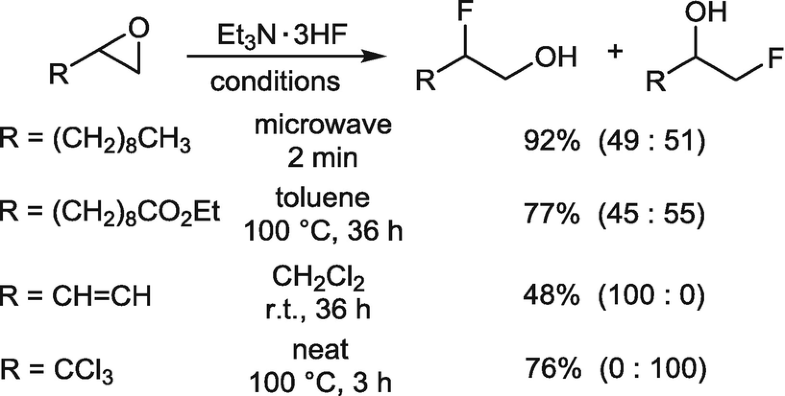 While in case of the all-syn-isomer heating with Et3N·3HF at 120 °C gave 50% of the target fluorohydrin, the ring opening of the diastereoisomer was more efficient to provide 89% of the diastereomeric product by heating with a mixture of Et3N·3HF and Et3N in acetonitrile at 110 °C for 3 days  (Scheme 87). 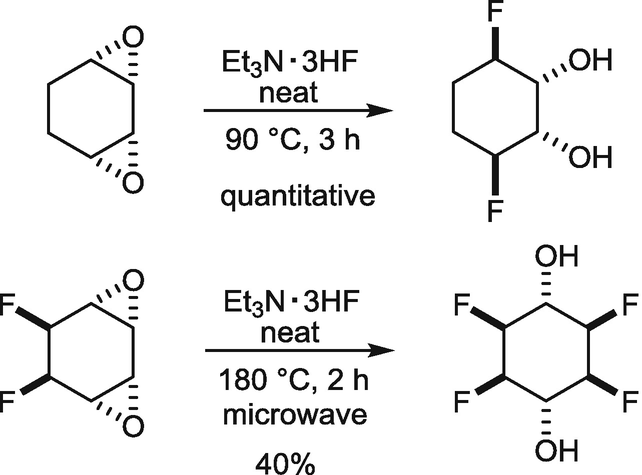 Vicinal difluorides are accessible from epoxides directly by microwave irradiation with N,N-diethyl-α,α-difluoro-(m-methylbenzyl)amine (DFMBA) in combination with Et3N·3HF. This conversion is stereospecific as demonstrated in reactions of diastereoisomeric epoxides of methyl (Z)- and (E)-octadec-9-enecarboxylates  (Scheme 88). Transformations of terminal epoxides under similar conditions tolerate different functional groups such as acetates and ethers. The corresponding 1,2-difluoroalkyl derivatives were isolated in 67–78% yield. These conversions proceed as two step processes consisting of acid-catalyzed epoxide ring opening to form vicinal fluorohydrins followed by nucleophilic deoxygenation/fluoridation . 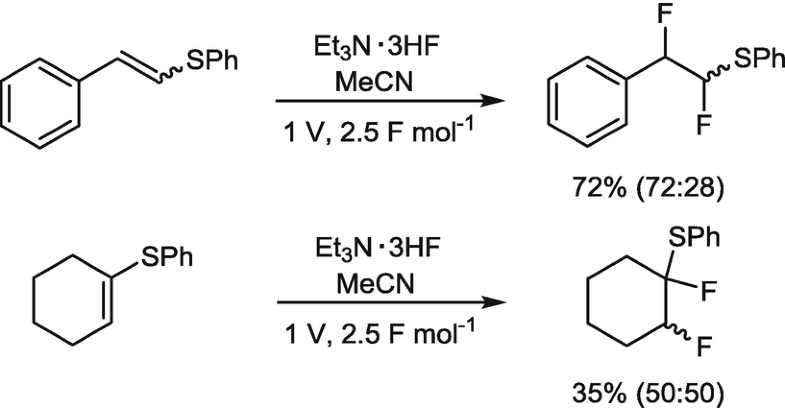 In addition to application of Et3N·3HF in substitution reactions, this reagent has also been applied to provide the source of nucleophilic fluoride as reaction partner in electrophilic addition reactions across double bonds such as hydrofluorinations, halofluorinations (formal additions of interhalogens), and other combinations of electrophiles with fluoride sources such as sulfenyl- or selenenylfluorinations. These reactions allow the introduction of a fluoride under much milder conditions and usually more selective than direct hydrofluorination. Moreover, the target β-halo-, β-thio-, or β-seleno substituents are very useful functionalities for elimination or substitution reactions [1, 2, 3, 4, 75]. The most common way to obtain fluoroalkanes from alkenes is the addition of HF across double bonds. Usually this addition occurs according to the Markovnikov rule. Reactions can be executed in liquid, anhydrous HF (AHF). However, for lab scale preparations, because of troublesome handling of AHF, e.g., volatility, high reactivity, corrosiveness and toxicity, its use requires special equipment. Thus, combinations of HF with Lewis basic amines such as melamine∙6HF (14:86, w/w %) pyridine·9HF (30:70, w/w %) or Et3N∙5HF (50:50, w/w %) are more convenient. The latter reagent is selective for electron rich, particularly for trisubstituted, alkenes  (Scheme 89). Reagents like Et3N∙3HF (64:36, w/w %), however, are too less acidic and do not react with alkenes. 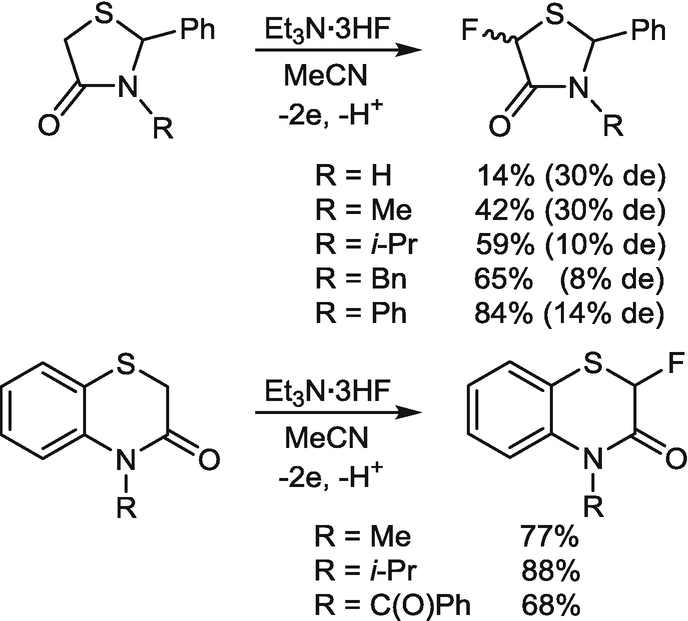 The combination of Et3N·3HF with a source of an electrophilic halogen like N-halosuccinimides (NXS) or N,N-dibromo-5,5-dimethylhydantoin (DBH) in polar aprotic solvents are very convenient and efficient reagents for halofluorinations of unsaturated compounds [77, 78] (Scheme 90). Generally, these reactions proceed stereospecifically as anti-1,2-additions and regioselectively according to the Markovnikov rule. Thus, the formal addition of halofluorides like “BrF” towards (Z)-cycloalkenes like (Z)-cyclododecene gave trans-2-fluoro-1-halocycloalkanes, while from (E)-cyclododecene, the cis-diastereomers were formed exclusively  (Scheme 91). As examples for factors affecting the regioselectivity, halofluorinations of different methallyl compounds were investigated showing that a chlorine atom did not change the regioselectivity as compared to 2-methylbutene (both >99:1 for bromofluorination). A phenoxy group had almost no effect on the ratio of regioisomers as well but lowered the yield. 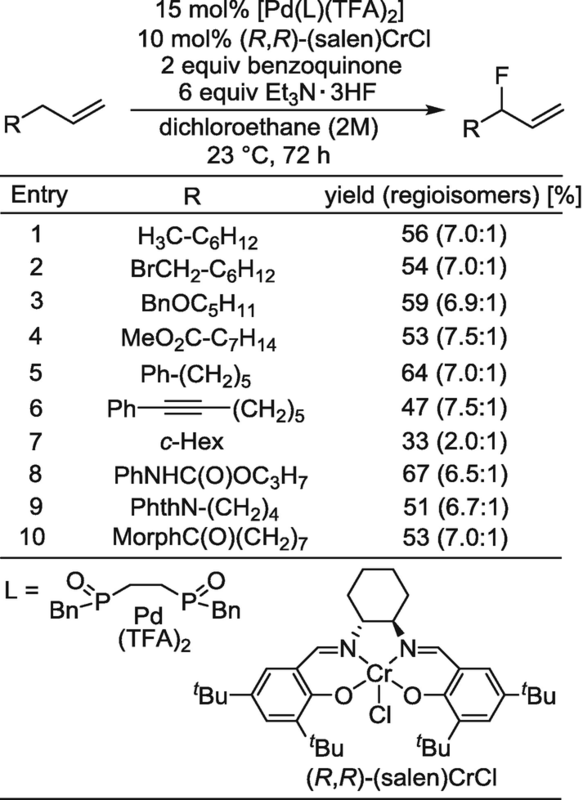 The phenylthio substituent on the other hand did significantly decrease both the yield and the regioselectivity due to neighboring group participation. Chlorofluorination gave only traces of the target product because of different competing side reactions  (Scheme 92). Furthermore, when another nucleophilic group is available in a suitable distance from the reaction center, this group can act as an internal competing nucleophile and fluoride is introduced after this type of neighboring group participation. This reaction pathway is obtained in all halofluorination reactions of 9-oxabicyclo[6.1.0]non-4-ene and the ratio of the formed products is almost independent from the electrophile  (Scheme 93). Chlorofluorination of cyclohexene and methallyl chloride with the combination of NCS and Et3N·3HF gave the expected chlorofluorides in high yields  (Scheme 94). Mostly bromofluorinations of unsaturated compounds and influences of the substrate structure on the reaction outcome were investigated . 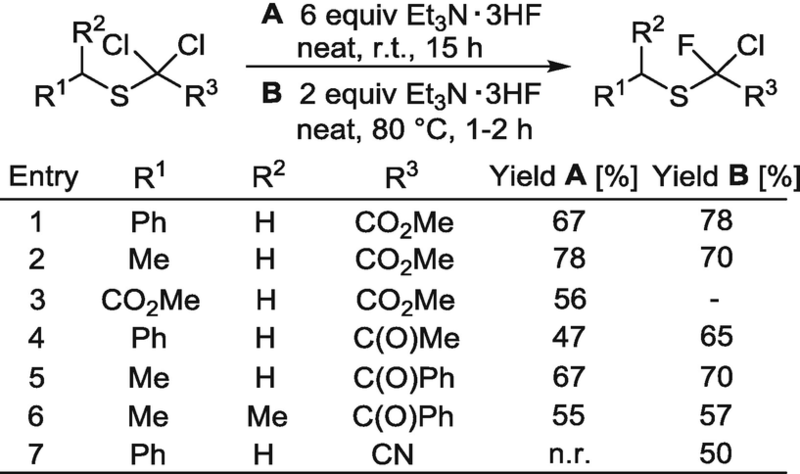 Thus, stereospecific anti-1,2-addition of the elements of BrF was observed in the reaction of (5E)- and (5Z)-dec-5-ene with NBS and Et3N·3HF in methylene chloride at 0 °C to give either the threo- and erythro-product almost exclusively  (Scheme 95). 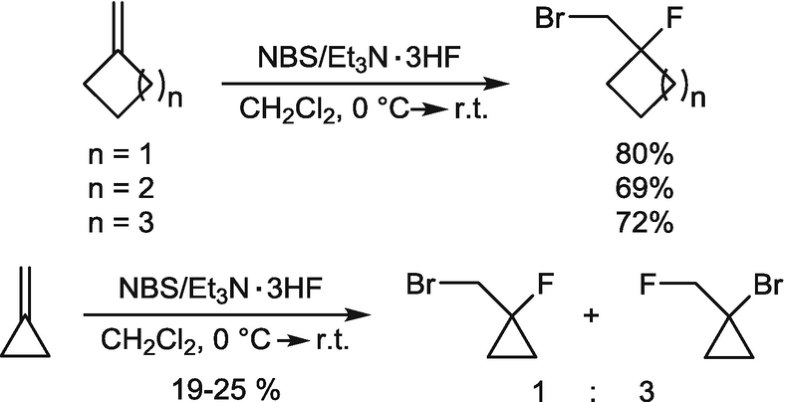 Using unsymmetric alkenes bromofluorination occurs according to the Markovnikov rule. Thus, from terminal alkenes approximately 10:1 mixtures of the 1-bromo-2-fluoroalkanes and its regioisomers were formed in good yields. Also (ω-1)-unsaturated long chain carboxylic acids were used as starting materials. From isobutene and isoprene the Markovnikov products were formed exclusively [77, 78] (Scheme 96). 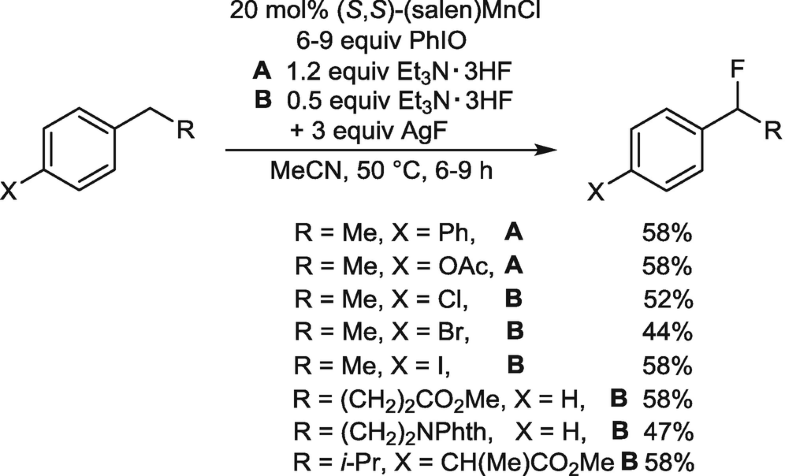 The bromofluorination of allylbenzene proceeded regioselectively giving a 89:11 mixture of the regioisomers in 83% yield. The bulky o-benzyl substituent lowered the yield but did not significantly erode the yield of the reaction  (Scheme 97). Methallyl azide and its homologue provided the corresponding bromofluorides at 0 °C. These products were reduced, Boc-protected at nitrogen and cyclized to the corresponding fluorinated azetidine or pyrrolidine derivatives  (Scheme 98). Application of allylic imines is another extension of the substrate scope. Thus, a series of N-allyl aldimines was reacted with NBS/Et3N·3HF in methylene chloride at r.t. for 4–7 h gave the products in good yields [82, 83] (Scheme 99). 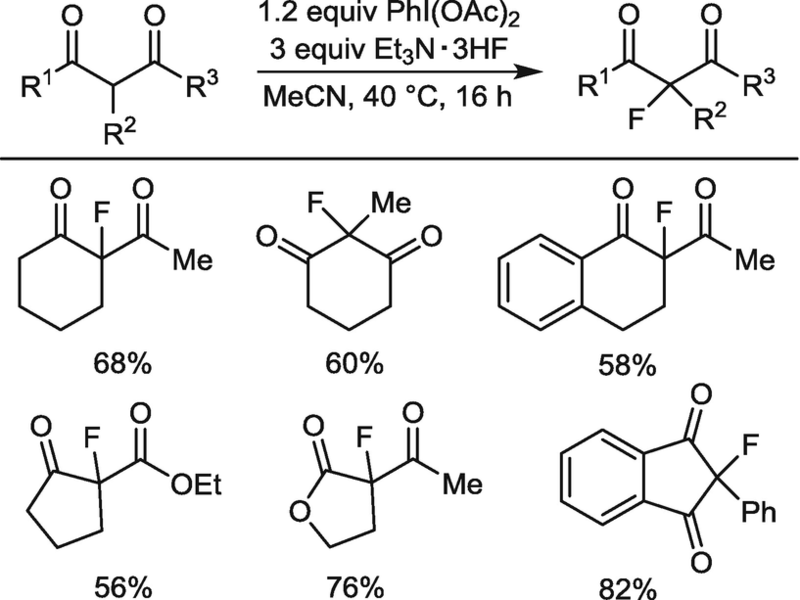 Also, from a variety of styrenes substituted in the aryl group, the corresponding 1-aryl-2-bromo-1-fluoroethanes were formed, mostly in good yields, from 2-phenylalk-1-enes exclusively 2-bromo-1-fluoro-1-phenylalkanes were formed in excellent yields , and from 1-phenylcycloalkenes the corresponding bromofluorides were formed in good yields  (Scheme 100). The latter reaction was applied as initial step in a three-step synthesis of 2-fluoro analogues of the pain killers Ibuprophene, flurbiprofen, and naproxen  (Scheme 101). In addition to the stereoisomeric cyclododecenes (see section “Halofluorination”) also several other cycloalkenes were reacted with NBS and Et3N·3HF. While the six-membered ring gave exclusively the expected trans-1-bromo-2-fluorocyclohexane with 88% yield, (Z)-cyclooctene as the first member of medium-sized cycloalkenes gave a 1:4 mixture of the trans-1,2-product and the cis-1,4-product as a result of a transannular hydride shift in the cationic intermediate. Wagner-Meerwein-type rearrangement was observed with norbornene. No 1,2-addition product was found, but two stereoisomeric 2,7-substituted norbornanes were formed  (Scheme 102). 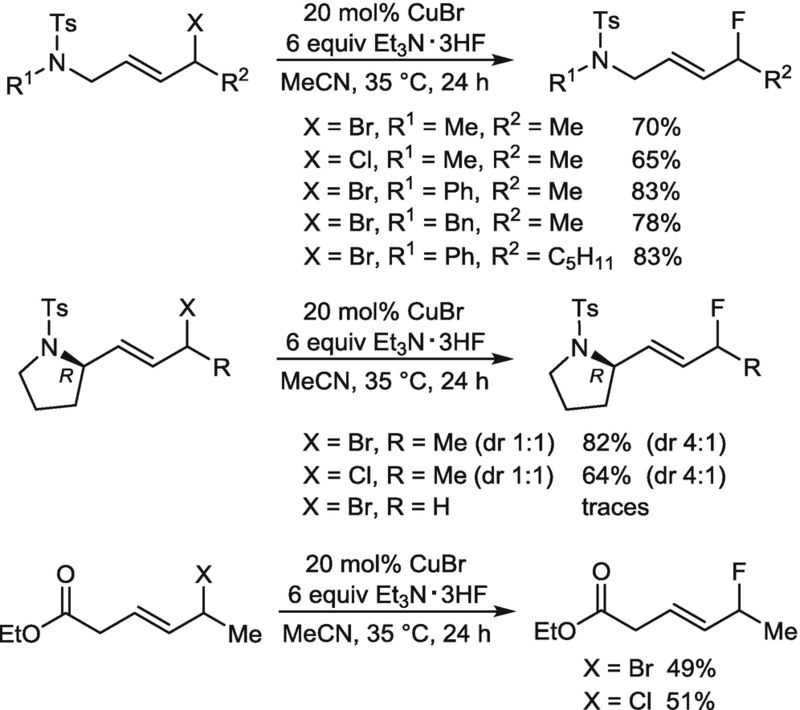 Transannular π-participation was observed when norbornadiene was reacted under the same conditions to give two diastereomeric nortricyclene derivatives and also (E,Z)-cyclodecadiene reacted with π-cyclization to provide the 1,4-cis/trans-isomeric cis-decaline derivatives, while cycloocta-1,5-diene gave the trans-1,2-addition product with minor amounts of two diastereoisomeric 2,6-disubstituted cis-bicyclo[3.3.0]octanes  (Scheme 103). 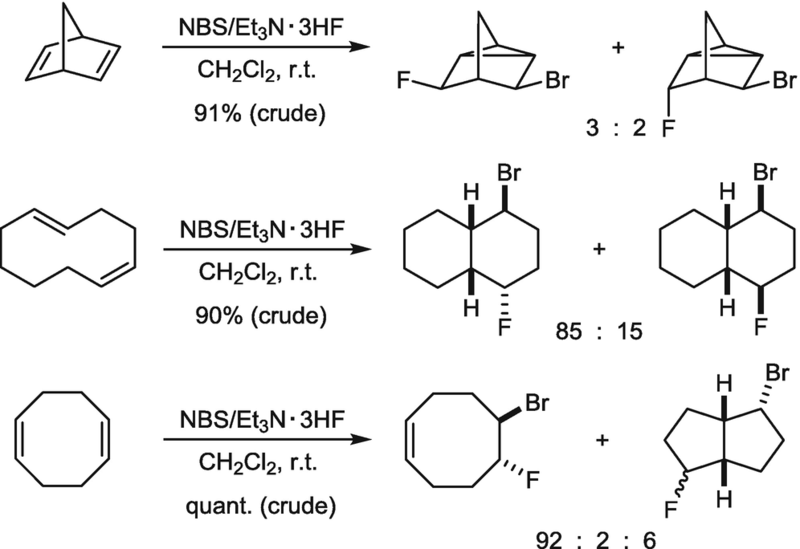 The scope of alkenes applied in bromofluorination has been extended to exomethylene cycloalkanes. While the four-, five-, and six-membered rings delivered the expected 1-bromomethyl-1-fluoro-cycloalkanes according to the Markovnikov rule, from exomethylene cyclopropane a 1:3 mixture of the 1-bromomethyl-1-fluoro- and the 1-bromo-1-fluoromethylcyclopropane in favor of the anti-Markovnikov product was formed in about 20% combined yield, due to the stabilizing effect of a cyclopropane ring on a neighboring cationic center  (Scheme 104). Also N-heterocyclic exomethylene compounds bearing the amino group in allylic or homoallylic positions have been used for bromofluorination. Thus, from N-Boc-3-methylenepyrrolidine the expected product was isolated in 68% yield and from N-Boc-4-methylenepiperidine the corresponding N-Boc-4-bromomethyl-4-fluoropiperidine was isolated in 92% yield. From both bromofluorides, more complex biologically active compounds were synthesized  (Scheme 105). Hexadecyl-methallyl ether on bromofluorination gave the target Markovnikov oriented tertiary fluorine product in 77% yield. This product was used as starting material for synthesis of a fluorinated ether lipid analogous to a platelet-activating factor . Under similar conditions, from long chain 2-(alkyloxymethyl)-2-propen-1-ols the desired bromofluorides are formed with high regioselectivity in moderate yields. 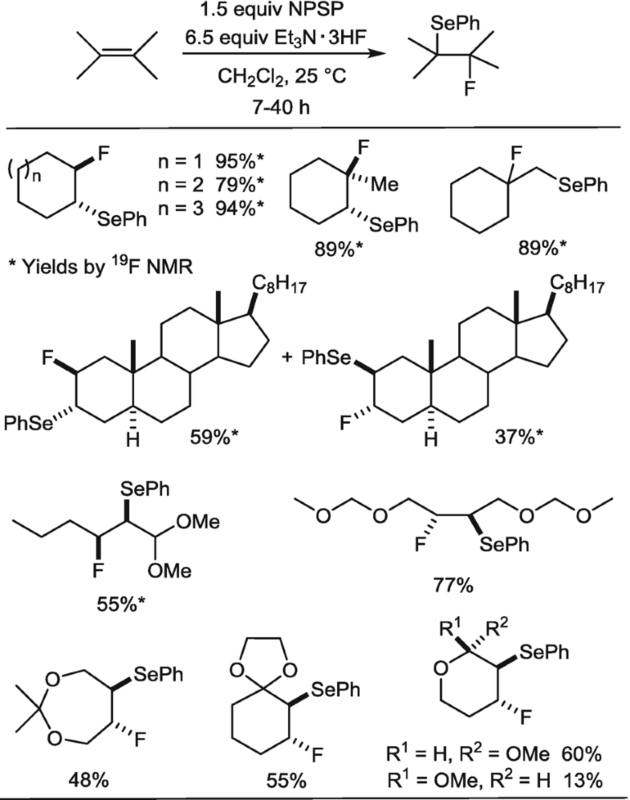 These compounds were used as starting materials for the preparation of fluorinated analogues of anticancer active ether lipids [88, 89] (Scheme 106). 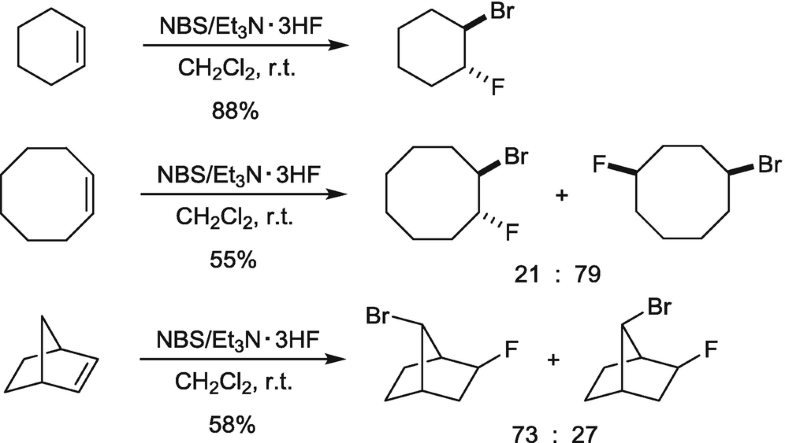 Analogously, bromofluorination of bis(metallyl)polyoxyethylene glycol ethers was found to be highly regioselective providing the corresponding tertiary fluorides in 67–86% yields and surprisingly high diastereoselectivity of 85:15. In case of the nor-methyl derivatives, the reactions are not selective leading to complex mixtures of regio- and diastereomers . Bromofluorination with NBS/Et3N·3HF in methylene chloride at r.t. was also successful for the 1,2-difluorinated double bond of stilbenes. One example is depicted in Scheme 107 . Iodofluorination of alkenes is frequently used to create both a strong fluorine-carbon bond and an iodine-carbon bond as a reactive functionality for further modification of the molecule’s core structure. In addition to the methods cited above in chap. 5.2 (according to Ref. ) 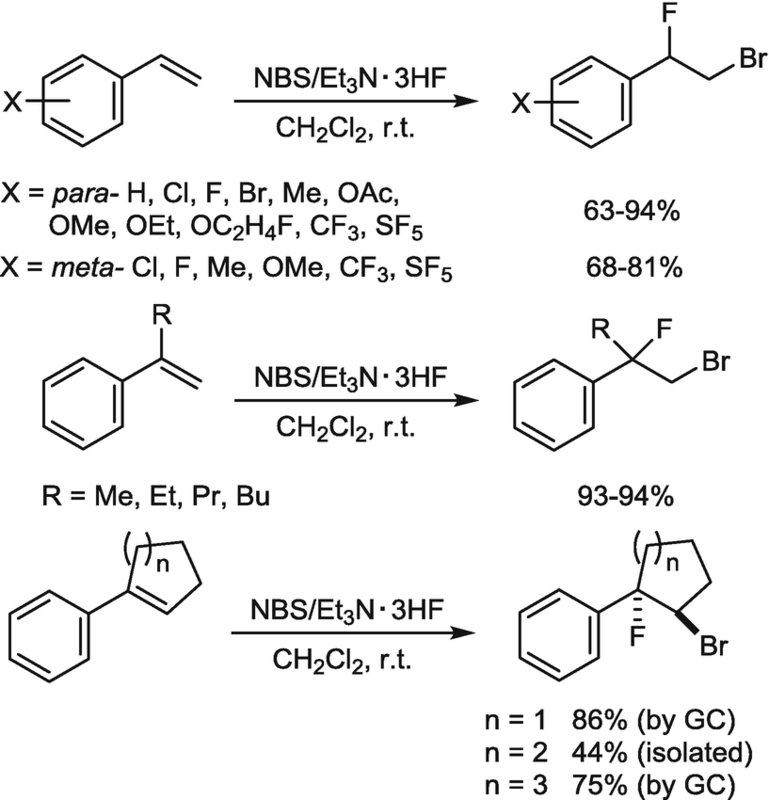 and the iodofluorination of methallyl chloride , an extension of the substrate scope of iodofluorination with NIS/Et3N·3HF to simple allenes has been reported  (Scheme 108). Besides the more common halofluorinations (Hal = Cl, Br, I), the combination of p-iodotoluene difluoride and Et3N·5HF was shown to be an efficient reagent for vicinal difluorination, particularly for terminal alkenes. Remote functional groups such as carboxylate, acetal, acetate, chloride, and even free OH-group are tolerated. As expected, a double bond in conjugation with an ester function is less reactive compared to a terminal one  (Scheme 109). The reaction of a cyclohexene derivative leading to cis-orientation of the vicinal difluoride showed that an iodonium species is involved in the mechanism of the reaction (Scheme 110). The iodonium species, however, seems not to be the only possible electrophile. Shreeve et al. used selectfluor™ in combination with Et3N·3HF to prepare 1,2-difluoro-1,1-diphenylethane with 79% yield from diphenylethylene. However, this is the only example and conditions were not provided  (Scheme 111). Recently, Gilmour et al. combined Hara’s original stoichiometric protocol with Shreeve’s method to a catalytic conversion of terminal alkenes to 1,2-difluoroalkanes using inexpensive p-iodotoluene as a catalyst. Thus, reactions of a broad variety of 1-alkenes with Selectfluor™ and mixtures of Et3N·3HF and Pyr·9HF (Olah’s reagent) in the presence of p-iodotoluene (20 mol%) in dichloroethane (DCE) at room temperature gave the target vicinal difluorides in up to 76% isolated yield  (Scheme 112). The reaction is quite sensitive to the conditions. Particularly, the used fluoride equivalent is crucial. An amine:HF ratio of 1:4.5 (combination of Et3N·3HF with Olah’s reagent) was shown to be optimal. 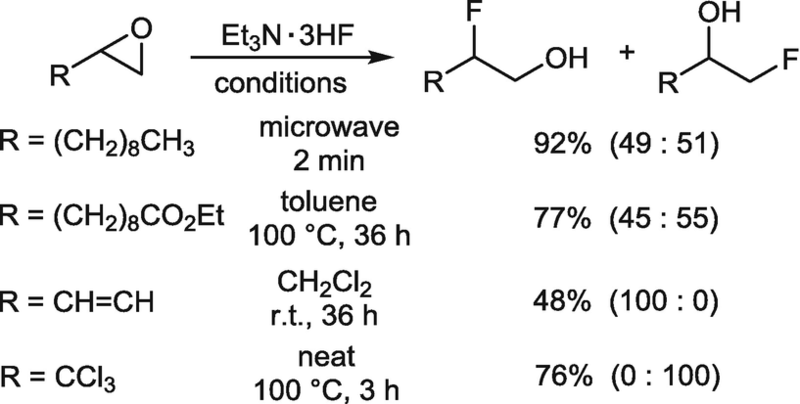 In case of application of Et3N·3HF alone, the conversion was <5%, while application of Olah’s reagent alone gave rise to a variety of side reactions and the target product was isolated in only 19% yield. Also the concentration of the reactants is important and should amount 0.1–0.2 mmol/mL. Dichloroethane can be replaced by dichloromethane without any effect on the reaction yield. Mechanistic investigations showed that from p-iodotoluene the hypervalent difluoroiodo species is formed as the actual electrophilic species forming a iodonium ion, which is replaced by fluoride in the final step (see above). Using a C2-symmetric chiral cocatalyst, 10% enantiomeric excess was found in the product of o-nitrophenyl derivative [93, 95]. In a back-to-back publication, Jacobsen et al. reported a very similar reaction. These authors used the same catalyst, but m-CPBA as an oxidizer and Olah’s reagent exclusively as fluoride source . Alternatively, difluorination of double bonds can also be accomplished electrochemically when alkenes are electrolyzed in Et3N·3HF. Generally, the reaction is not stereoselective and yields mixtures of cis/trans isomeric vicinal difluorides. When a nucleophilic cosolvent, e.g., acetonitrile is present, in addition to the difluorides products of solvent incorporation are formed, sometimes even as major products  (Scheme 113). 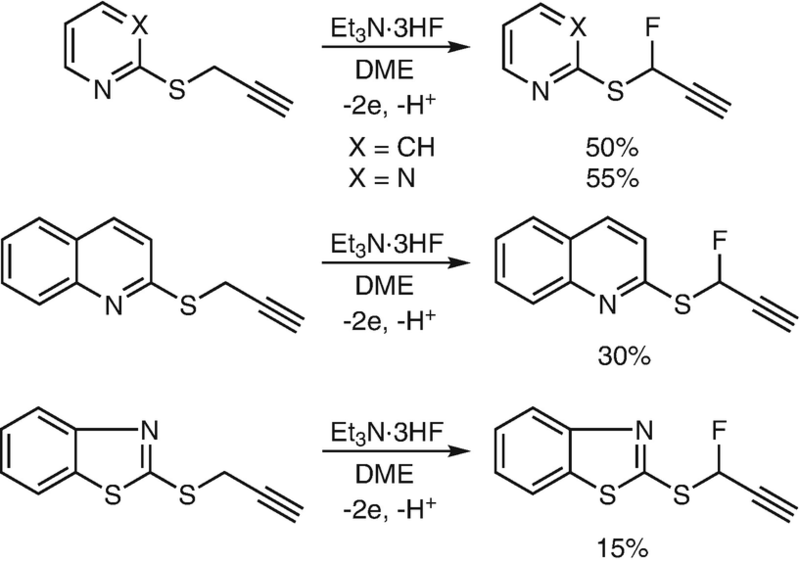 The electrofluorination of ordinary alkenes like styrene, stilbene, 2-methylbut-2-ene or 2,3-dimethyl-but-2-ene in neat Et3N·3HF gave the corresponding vicinal difluorides in 22–51% yield and from butadiene a 1:2 mixture of 1,2- and 1,4-difluoro products was formed (yield not given)  (Scheme 114). From phenyl vinyl thioethers corresponding vicinal difluorides were formed in fair to good yields always as mixtures of diastereomers. For example, from 2-(phenylthio)styrene a 72:28 mixture and from phenylthiocyclohexene a 50:50 mixture of the target difluorides was obtained  (Scheme 115). When enol esters were oxidized electrochemically in Et3N·3HF/MeCN, after basic workup, α-fluoro ketones were isolated in moderate yields. For example, from the enol acetate of ethylphenyl ketone the target fluoroketone was prepared in 65% yield. Analogously, the enol acetates of acetophenone, benzylphenyl ketone, isopropylphenyl ketone, and benzyl methyl ketone, the corresponding α-fluoro ketones were obtained  (Scheme 116). From the optically active enol camphanate of α-tetralone and its β-methyl derivative under analogous conditions four diastereoisomeric vicinal difluoro products were formed in approximately equal quantities. Thus, no directing effect of the remote stereogenic center in the ester moiety was observed. After chromatographic separation of the diastereomers and individual mild hydrolysis, the (R)- and (S)-enantiomers of β-fluoro-α-decalones were isolated in 65–70% chemical yield and > 95% enantiomeric excess  (Scheme 117). In the absence of an internal leaving group, the cosolvent can compete with fluoride to attack the intermediate β-fluoro carbenium ion. 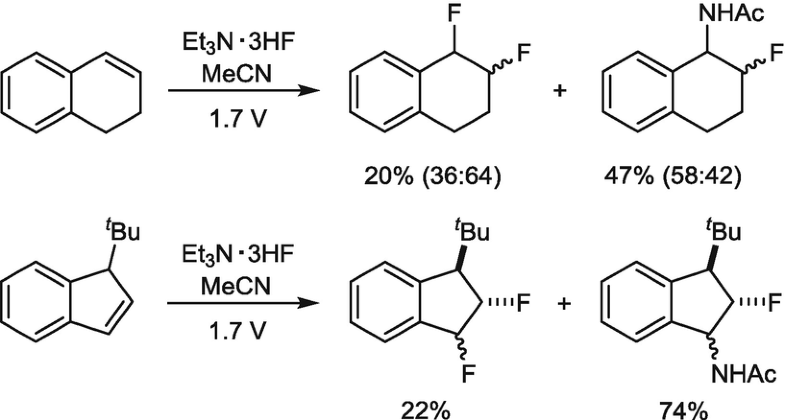 1,2-Dihydronaphthalene, indene, and 3-tert-butylindene on electrolysis in acetonitrile solution of Et3N·3HF gave mixtures of diastereomeric difluorides and respective N-(β-fluoroalkyl)acetamides (after hydrolytic workup), while the 1,2-difluoro-3-tert-butylindane was the exclusive product (67% yield, 44:56 ratio of diastereomers) in methylene chloride as cosolvent  (Scheme 118). 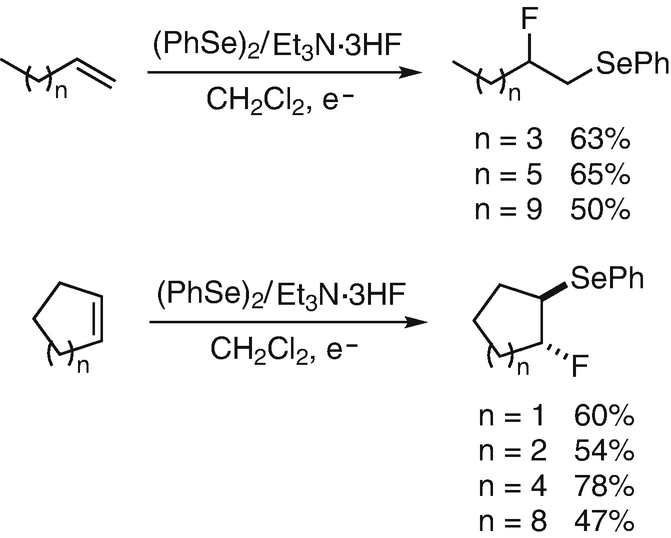 The combination of an electrophilic sulfur or selenium reagent with Et3N·3HF gives rise to sulfenyl- and selenenylfluorations of alkenes. In this way, the electrophilic anti-1,2-addition of the elements of methane- or arenesulfenylfluoride or the respective selenenyl analogues was accomplished . Thus, in a one-pot reaction of dimethyl(methylthio)sulfonium tetrafluoroborate (DMTSF) and Et3N·3HF with various types of alkenes was used for the synthesis of β-fluoroalkyl methyl thioethers. Like in the case of the halofluorinations, from cis-cycloalkenes trans-1-fluoro-2-(methylthio)cycloalkanes were formed, while trans-cycloalkenes provided the cis-products, always in good yields. 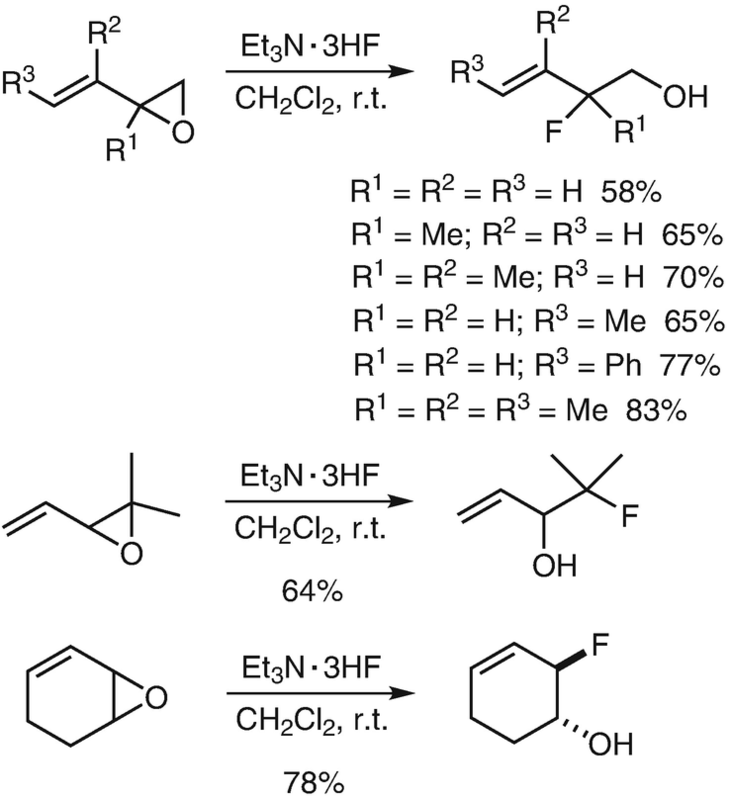 With unsymmetrical alkenes, these reactions proceeded regioselectively to give mainly the Markovnikov-products. With norbornadiene exclusively exo-attack of the electrophile on one of the double bonds and subsequent transannular participation of the second π-bond led to two diastereomeric 3,5-disubstituted nortricyclene derivatives, while starting from cycloocta-1,5-diene only the trans-1,2-product has been observed [3, 78] (Scheme 119). Phenylselenofluorinations of various kinds of alkenes and alkynes were realized in good yields using N-phenylselenophthalimide (NPSP) in combination with Et3N·3HF. 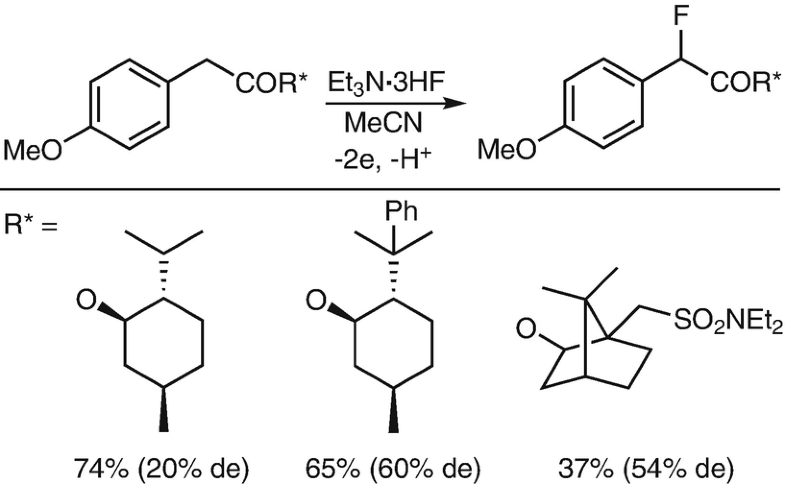 Also these reactions occurred as anti-1,2-additions to form β-fluoroalkyl phenylseleno ethers from alkenes. By way of example, from 5α-cholest-2-ene a mixture of two trans-configured regioisomers were formed in a ratio of 3:2 [3, 78]. 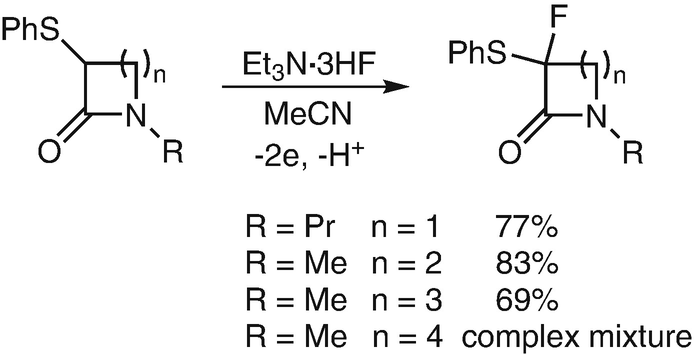 Due to the weak acidity of Et3N·3HF, acid sensitive alkenes like methylenecyclohexane yield the corresponding 1,2-adducts without rearrangement of the alkene prior to the addition of the elements of PhSeF and also acetals of α,β-unsaturated aldehydes or ketones provide the trans-1,2-products bearing the electrophile next to the acetal function  (Scheme 120). Phenylselenenyl fluoride [PhSeF] is unstable but was generated in situ by electrochemical oxidation of diphenyl diselenide in a Et3N∙3HF-CH2Cl2-Pt system at 0 °C. The species was added to carbon-carbon double bonds of terminal and cyclic alkenes to provide the target α-fluorinated phenylseleno ethers in fair to good yields. The addition occurred according to the Markovnikov rule and gave the trans-products in case of the cycloalkenes  (Scheme 121). In 2014, Xu et al. 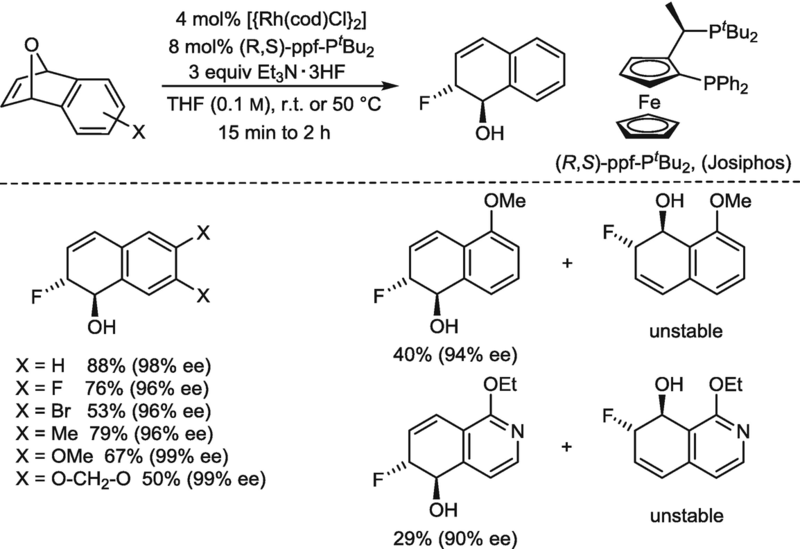 published an iron(II)-catalyzed intramolecular aminofluorination of N-alkoxycarbamates derived from allylic alcohols using Et3N∙3HF as a fluoride source and molar amount of XtalFluor-E affording the exo-cyclization products with high regioselectivity. The anti/syn-diastereoselectivity depends on the substituents R1 and R2 on the double bond. Interestingly, in case of substrate with R1 = H and R2 = Ph when reacted under the same conditions, but applying the optically pure ligand, 23% ee was found in the major product  (Scheme 122). A similar Cu-catalyzed amidosulfonyl fluorination does work also intermolecularly for styrene derivatives. 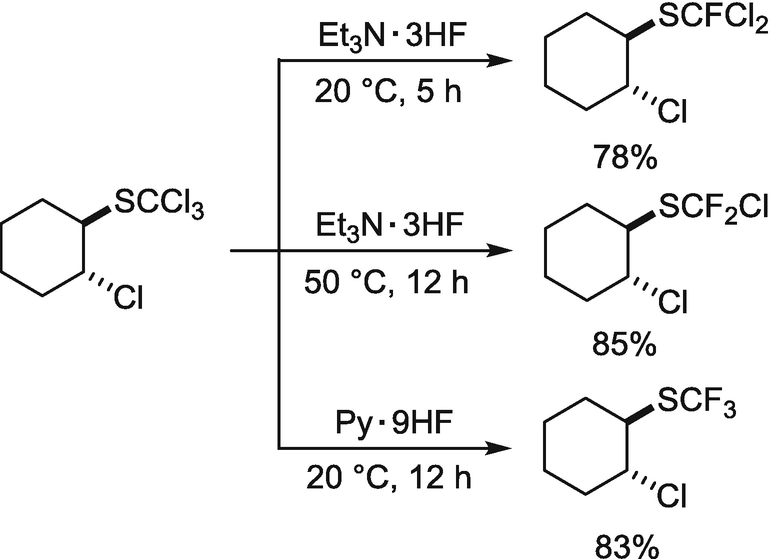 Thus heating to 70 °C in dichloroethane (DCE) of a variety of substituted styrenes with excess Et3N∙3HF and N-p-toluenesulfonylimino-phenyliodinane (Ph-I=N-Ts) in the presence of catalytic amounts of Cu(MeCN)4BF4, the ligand Neocuproine (2,9-dimethyl-1,10-phenanthroline) and a substoichiometric amount of Co(CO)6 delivered the target 2-fluorosulfonamides in fair to good yields. Also other sulfonamide reagents can be used for this type of reactions  (Scheme 123). 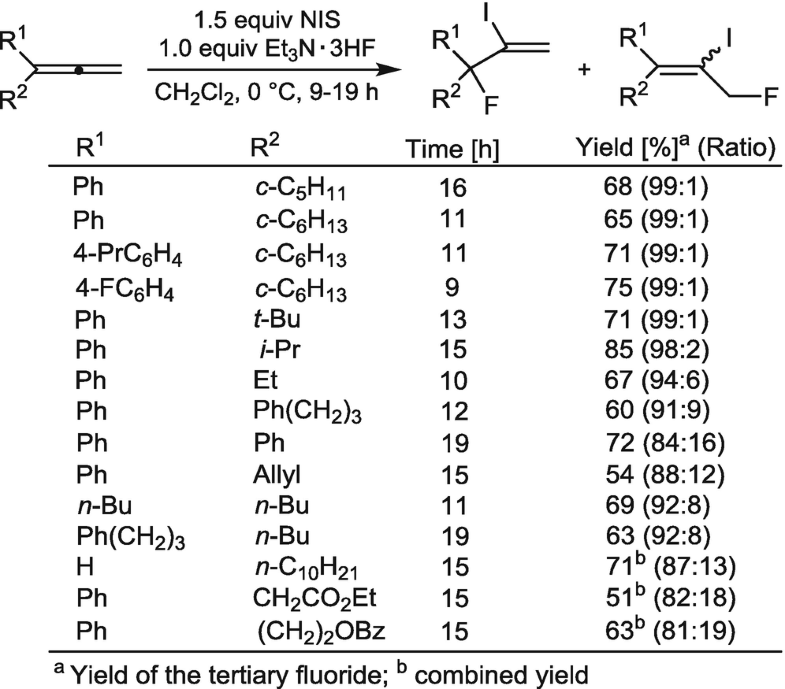 In summary, this chapter showed that Et3N∙3HF is an extraordinary and highly versatile fluorinating agent suitable for many different synthetic applications, particularly for the preparation of plenty of alkyl fluorides. Moreover, a broad variety of vinyl fluorides were synthesized from acetylenes using Et3N∙3HF and many fluorinating substitutions at sp2 hybridized carbon atoms were described in the literature. Furthermore, the reagent has been used in organometallic chemistry for the preparation metal-fluorine bonds of catalytic metal complexes. Last but not least, the reagent has been applied for deprotection of silylethers. All these reactions are out of the scope of this chapter. In the future, many more examples will demonstrate the versatility of Franz’s reagent.